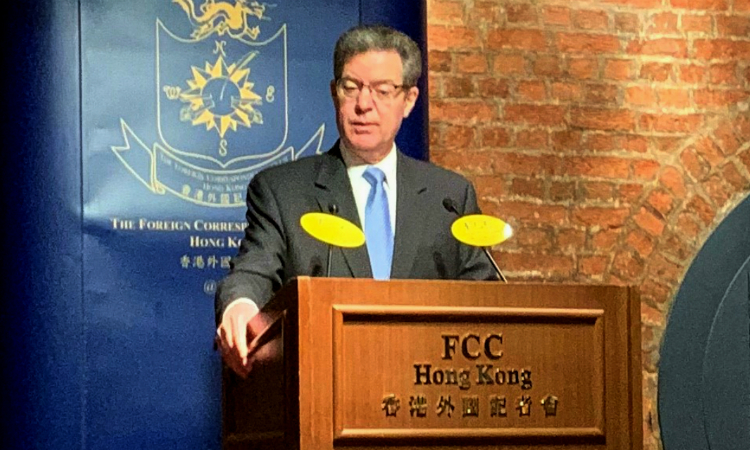 March 21, 2019 - Pursuant to section 301 of the United States-Hong Kong Policy Act of 1992, as amended (the "Act"), the Department submits this report on recent developments in Hong Kong from May 2018 through March 2019. 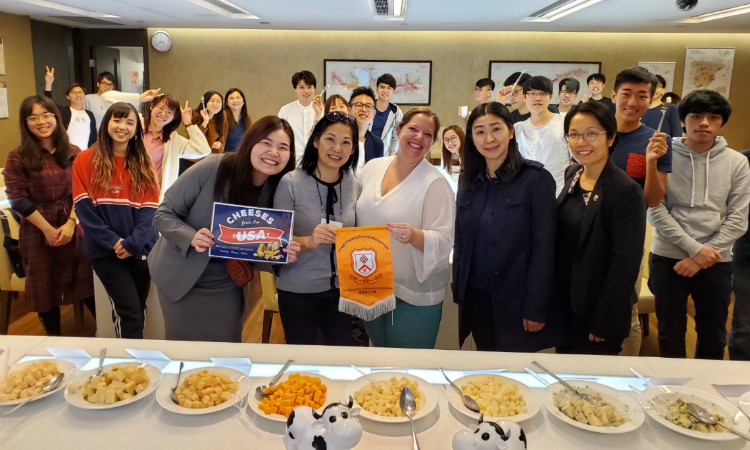 Students of the School of Hotel and Tourism Management, the Hong Kong Polytechnic University enjoyed great time at workshops “Discover U.S. Cheese” on March 19, 2019 hosted by the U.S. 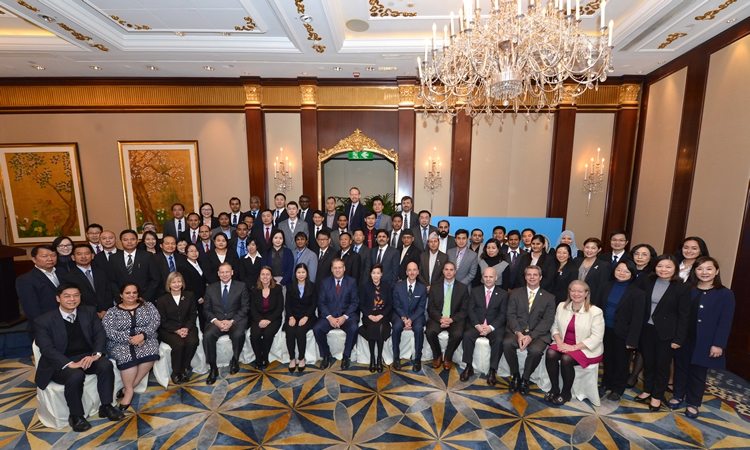 Dairy Export Council. 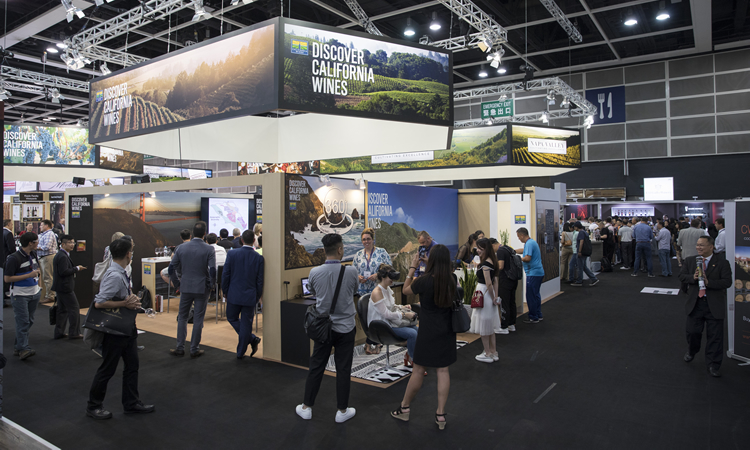 The United States was Hong Kong’s second-largest market for goods in 2017, and its second-largest market for services exports in 2016, accounting for 14.2% of Hong Kong’s services exports. 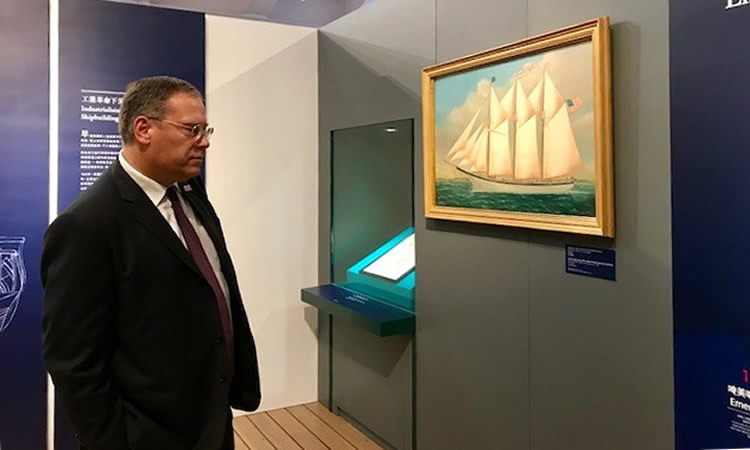 Consul General Kurt Tong presents a “U.S. 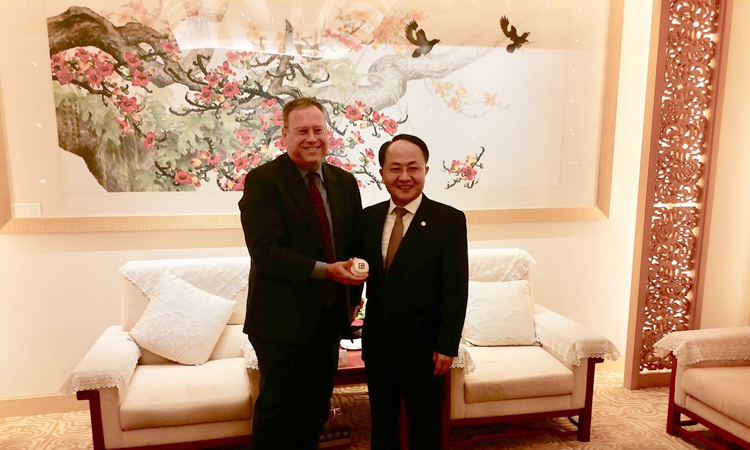 loves H.K.” baseball to Central Government Liaison Office Director Wang Zhimin at their June 14, 2018 meeting in Hong Kong. 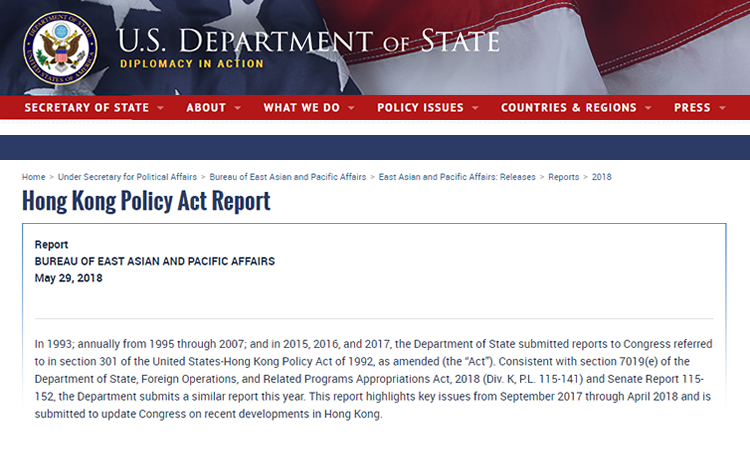 Hong Kong Policy Act Report (May 29, 2018) - In 1993; annually from 1995 through 2007; and in 2015, 2016, and 2017, the Department of State submitted reports to Congress referred to in section 301 of the United States-Hong Kong Policy Act of 1992, as amended (the "Act"). 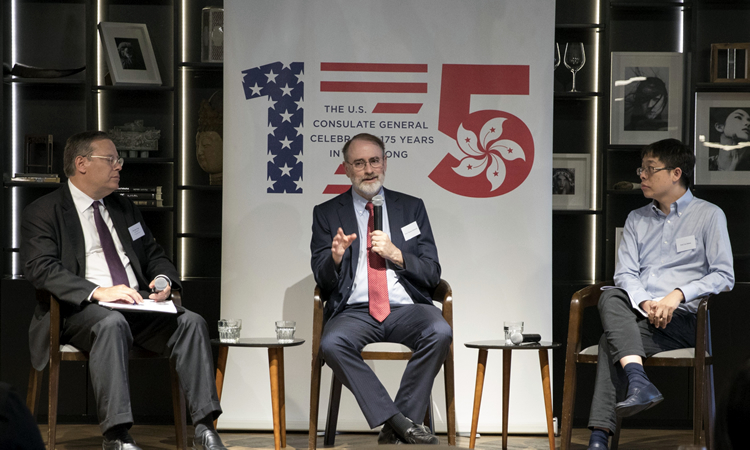 At the direction of President Donald J. Trump and President Xi Jinping, on May 17 and 18, 2018, the United States and China engaged in constructive consultations regarding trade in Washington, D.C.
On May 14, Consul General Kurt Tong hosted the first in the Consulate's Digital Economy Roundtable Series. 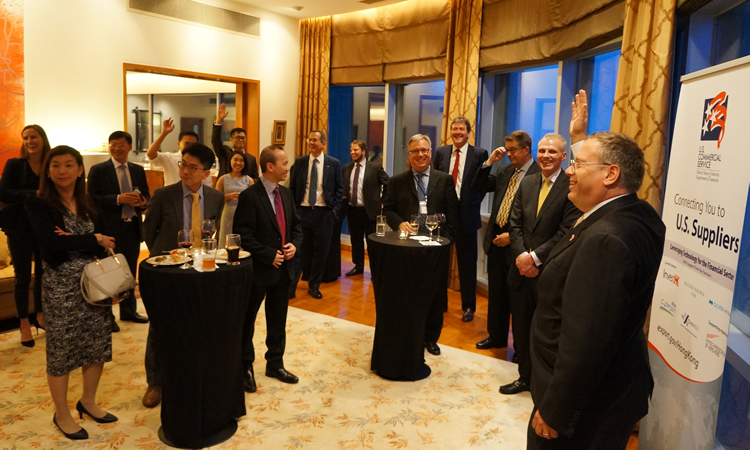 On May 7, 2018, Consul General Kurt W. Tong hosted a networking reception for U.S. and Hong Kong firms as part of a Fintech delegation the U.S. Commercial Service organized for U.S. companies interested in exploring opportunities in Hong Kong. 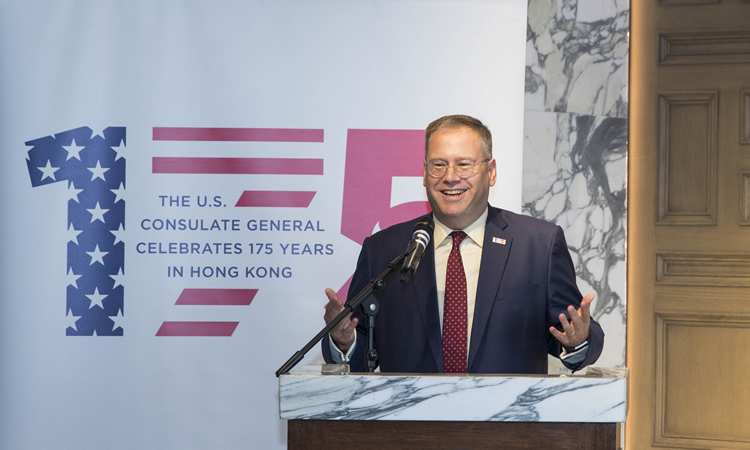 On May 3, the U.S. Consulate General sponsored a screening of The Post in honor of World Press Freedom Day at the historic Foreign Correspondents Club Hong Kong. 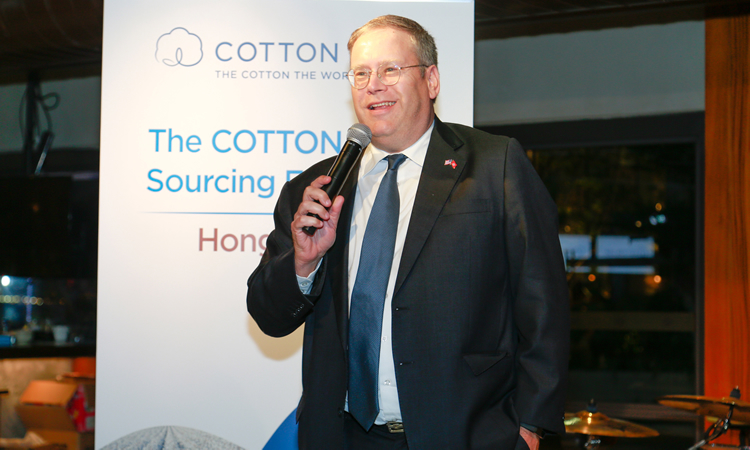 On April 10, Consul General Kurt W. Tong welcomed U.S. cotton producers, spinners, and ginners from around the world to Hong Kong for the Cotton USA Sourcing Fair 2018. 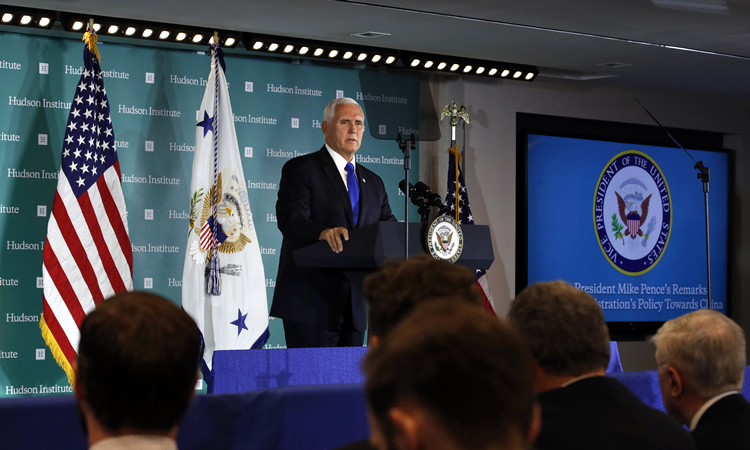 WASHINGTON, DC – As part of the U.S. response to China's unfair trade practices related to the forced transfer of U.S. technology and intellectual property, the Office of the U.S. Trade Representative (USTR) today published a proposed list of products imported from China that could be subject to additional tariffs. 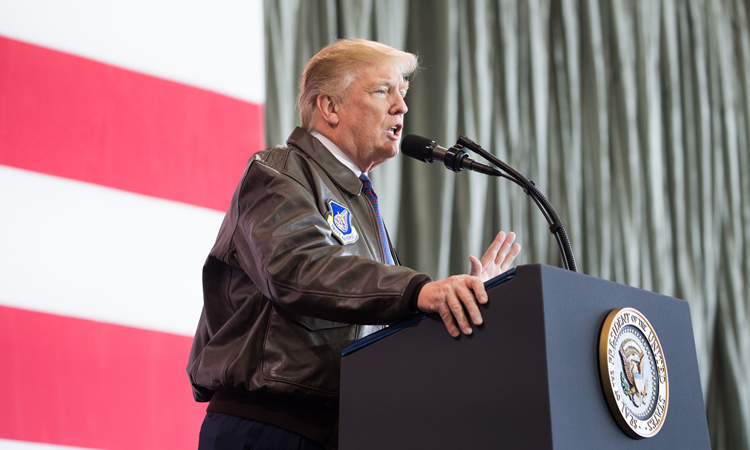 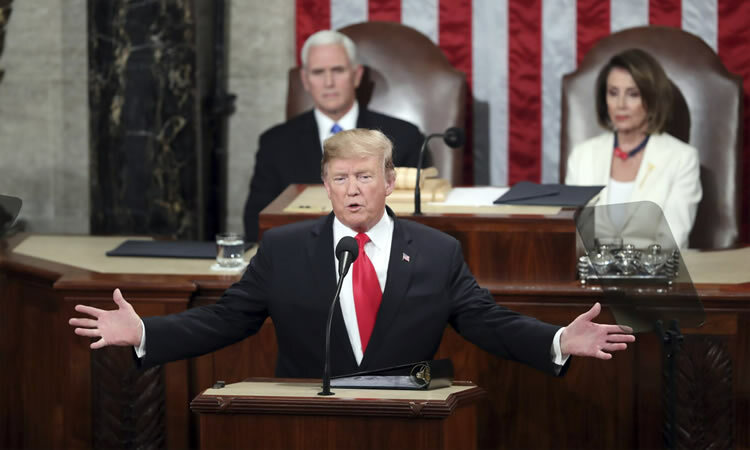 February 23, 2018 – The U.S. Department of the Treasury's Office of Foreign Assets Control (OFAC) today announced the largest North Korea-related sanctions tranche to date, aimed at disrupting North Korean shipping and trading companies and vessels to further isolate the regime and advance the U.S. maximum pressure campaign. 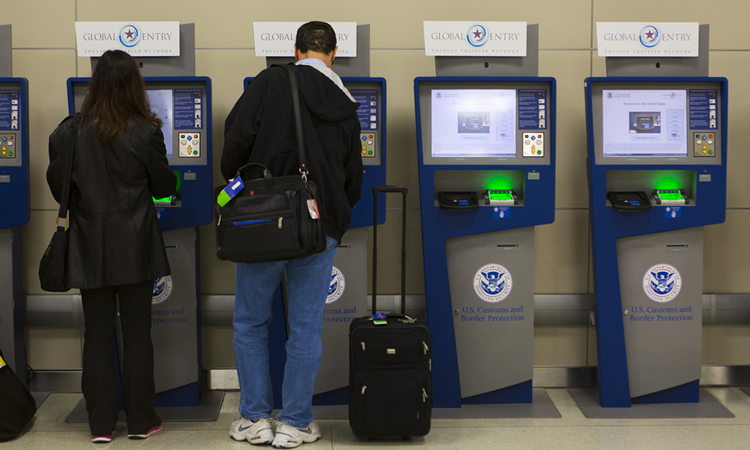 U.S. Customs and Border Protection (CBP), in conjunction with the U.S. Consulate General and American Chamber of Commerce in Hong Kong, will conduct a Global Entry mobile enrollment event in Hong Kong. 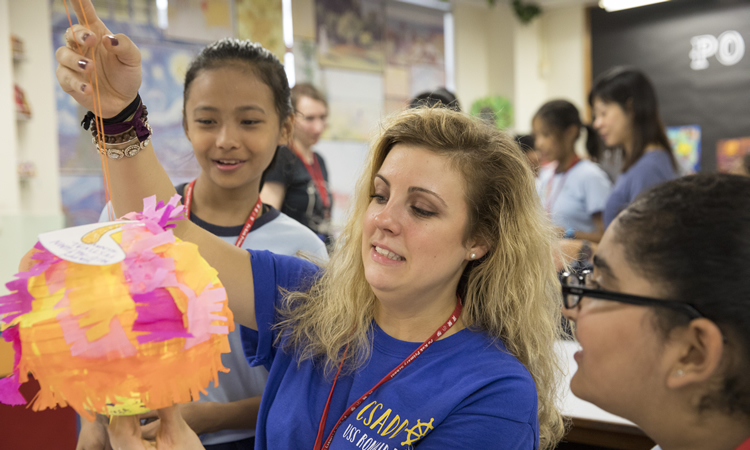 There are opportunities for study and scholarships at the East-West Center (EWC) for the 2018 academic year! 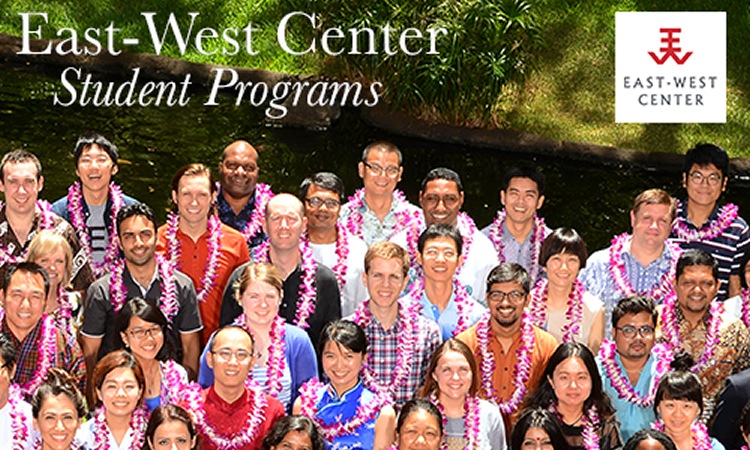 The East-West Center (EWC) is at the forefront of educating people of the Asia Pacific region to meet the evolving demands of global change. 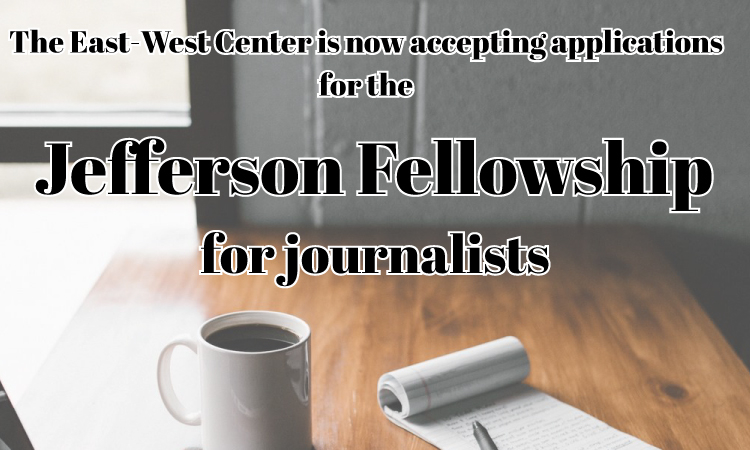 For more information, please see East-West Center Fellowships for the 2018 Academic Year . 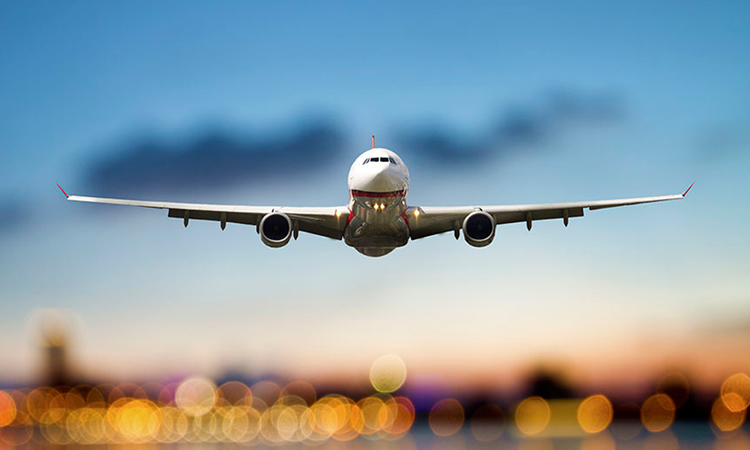 On June 28, Secretary of Homeland Security John Kelly announced enhanced security screening measures for all commercial flights to the United States. 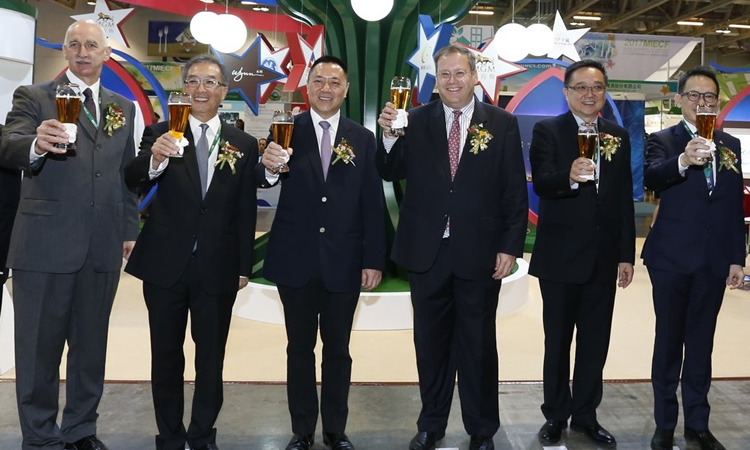 On October 19, Consul General Kurt Tong joined Macau SAR Secretary of Economy and Finance Lionel Leung, the leadership of AmCham Macau, and others to open the AmCham Corner at the 22nd Annual 2017 Macau International Trade and Investment Fair. 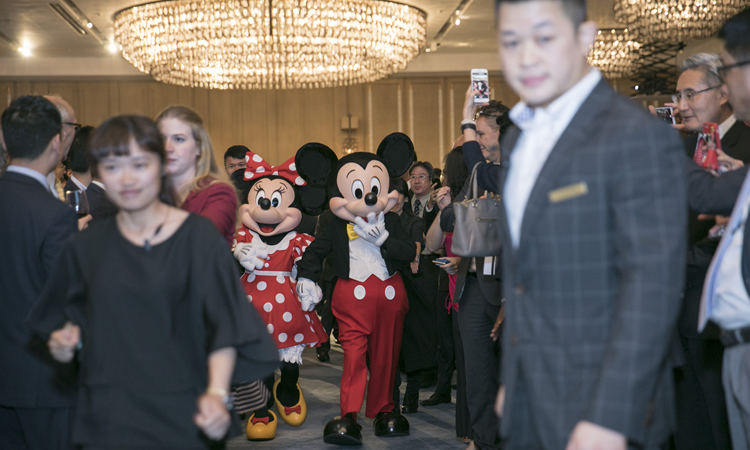 The event highlighted new opportunities to develop the U.S.-Macau economic relationship in the coming year. 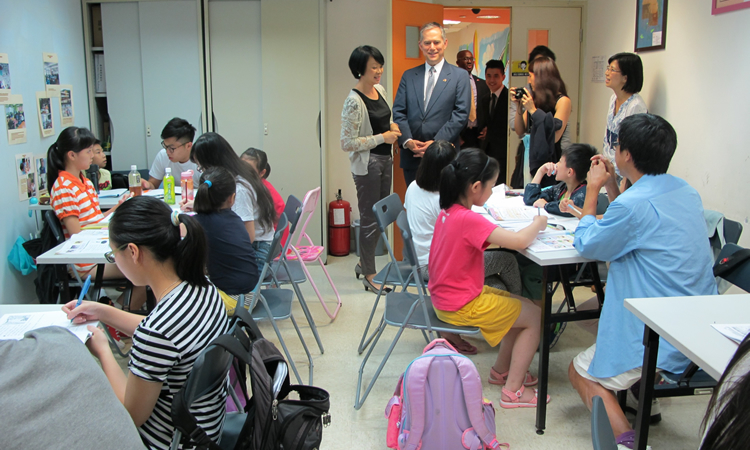 Consul General Tong visited Macau on August 30, where he joined American Citizen Services staff during their monthly visit to provide non-emergency consular services to Americans in Macau. 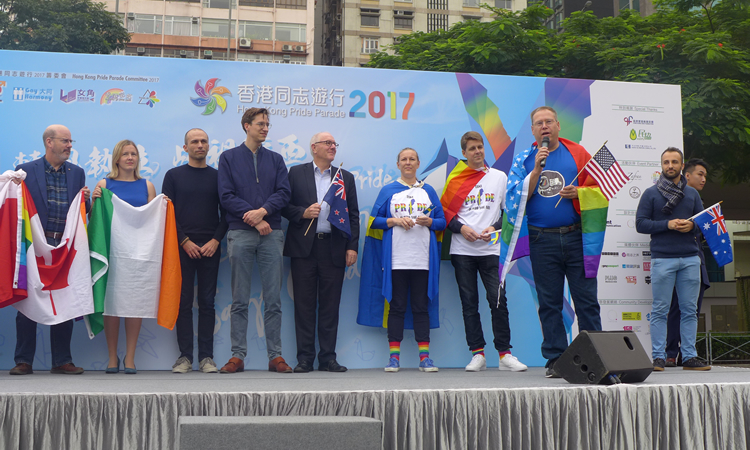 He also visited a center run by the charity Caritas, and helped deliver supplies to senior citizens there in the wake of Typhoon Hato. 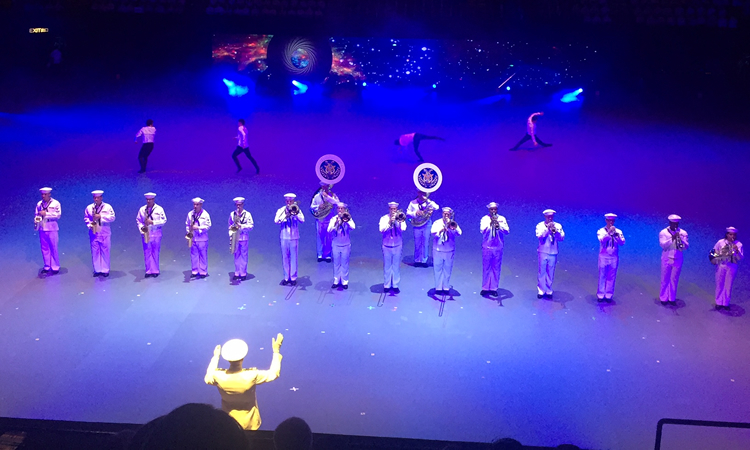 The U.S. Navy's 7th Fleet Band is performing at the International Military Tattoo in Hong Kong July 13-15, 2017. 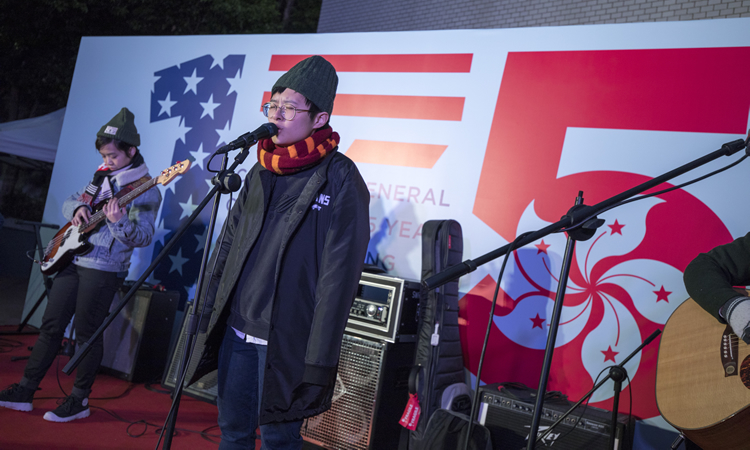 On July 5, 2017, the U.S. Consulate General celebrated the 241st anniversary of U.S. independence with over 1,000 invited guests, the largest-ever Fourth of July reception in Hong Kong. 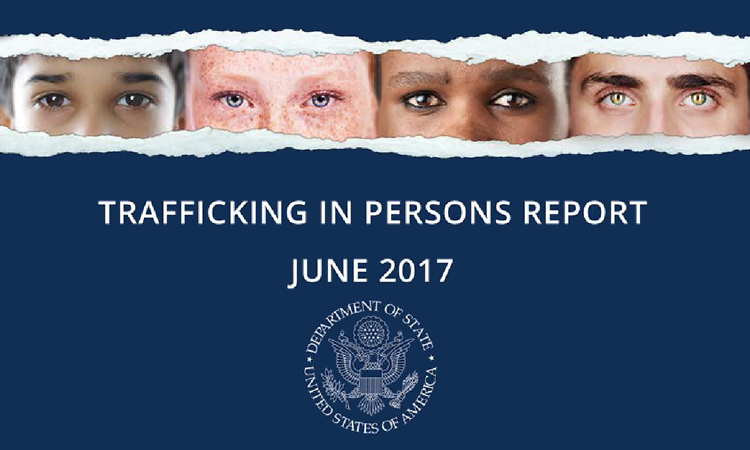 Secretary of State Rex Tillerson on June 27 released the U.S. Government’s annual assessment of efforts to combat trafficking in persons around the world, the 2017 Trafficking in Persons Report. 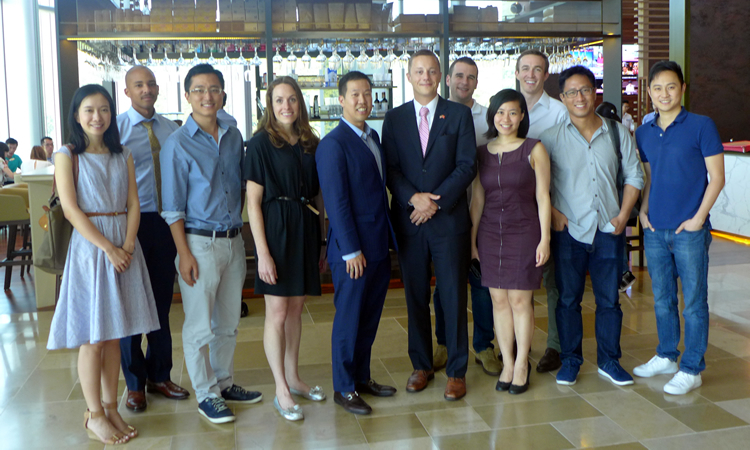 On June 21, Acting Consul General Thomas Hodges hosted a reception in honor of ten Fulbright Scholar Award recipients. 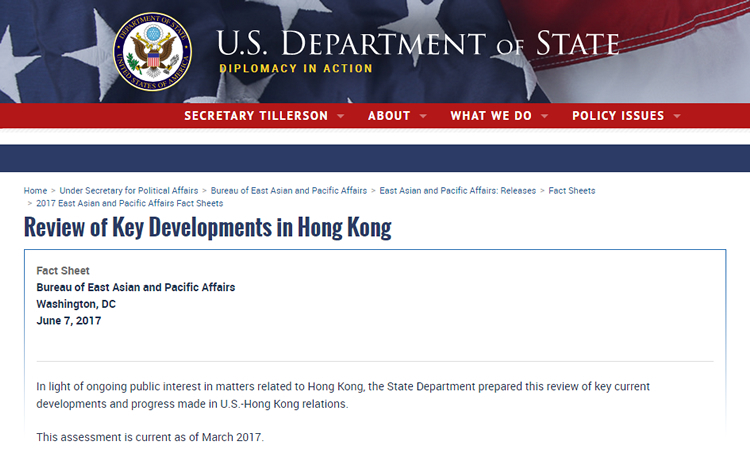 Fact Sheet: Review of Key Developments in Hong Kong (June 7, 2017) - In light of ongoing public interest in matters related to Hong Kong, the State Department prepared this review of key current developments and progress made in U.S.-Hong Kong relations. 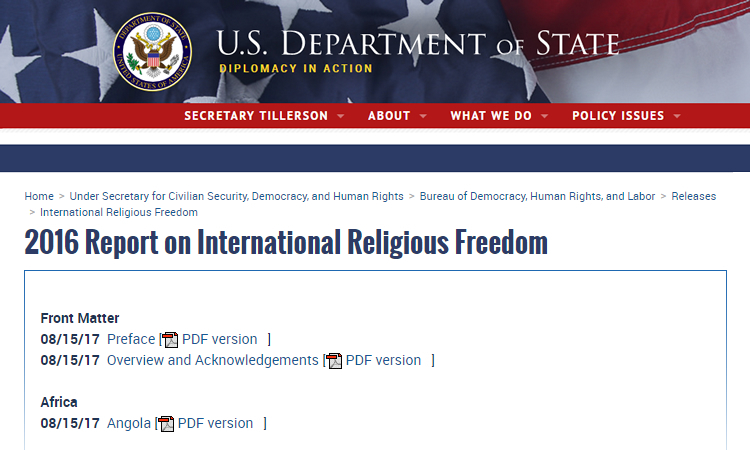 The new-look website has seven sections representing broad topics that may be of interest to you. 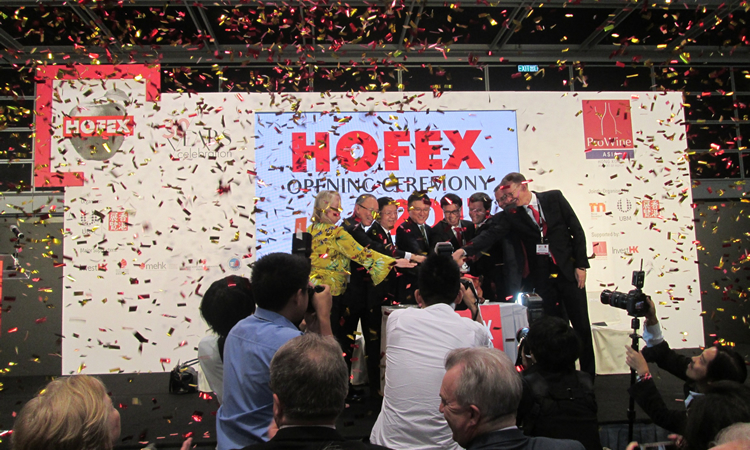 May 8, 2017 - More than 40 U.S. exhibitors showcased a dynamic array of top-quality U.S. agricultural, food, and beverage products from across the United States at the 2017 HOFEX food and hospitality tradeshow, with support from the U.S. Consulate's Agricultural Trade Office. 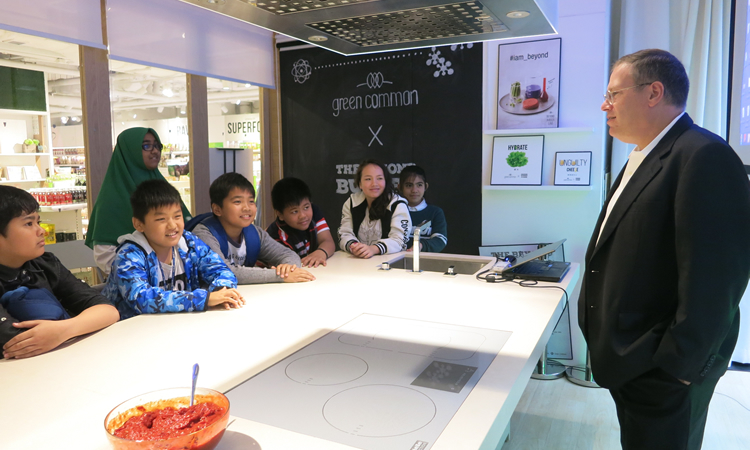 April 27, 2017 - Consul General Kurt Tong joined students from UMAH International Primary School for a demonstration on how to cook healthy, environmentally-friendly foods at Green Common in honor of Earth Day. 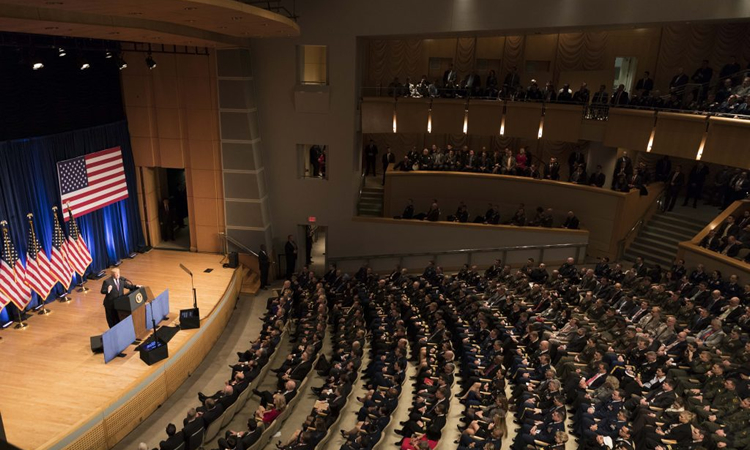 A Congressional delegation led by U.S. 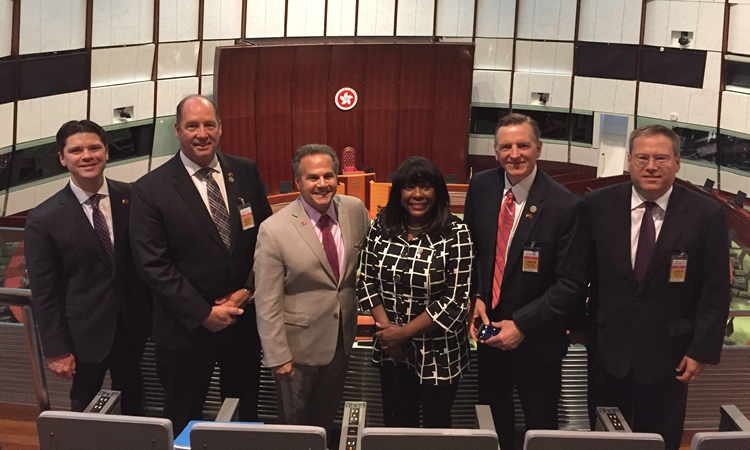 Senator Steve Daines (R-MT) visited Hong Kong April 12-13 as a part of their trip to the region. 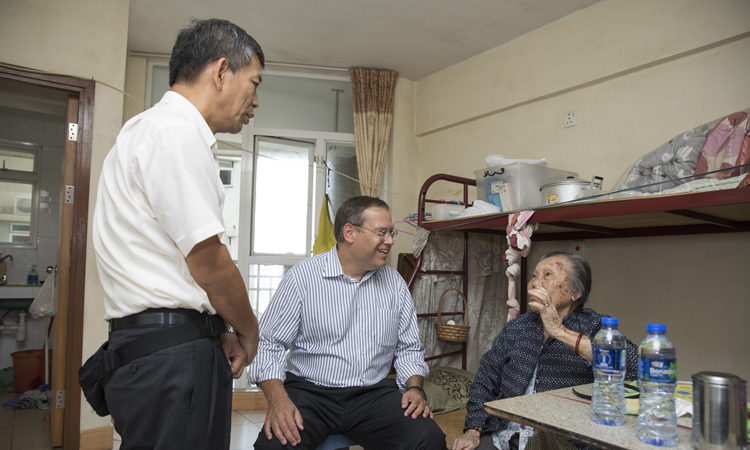 CG Tong visited Hong Kong's Ammar Mosque and O.R.S. 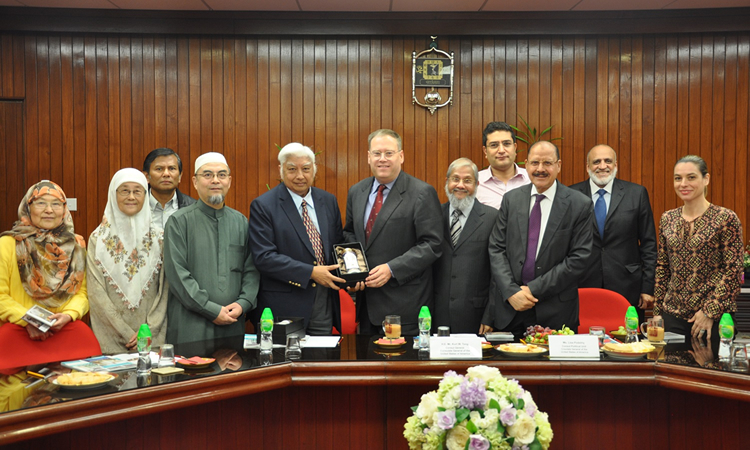 Islamic Centre on April 5 to meet with members of Hong Kong's Muslim community. 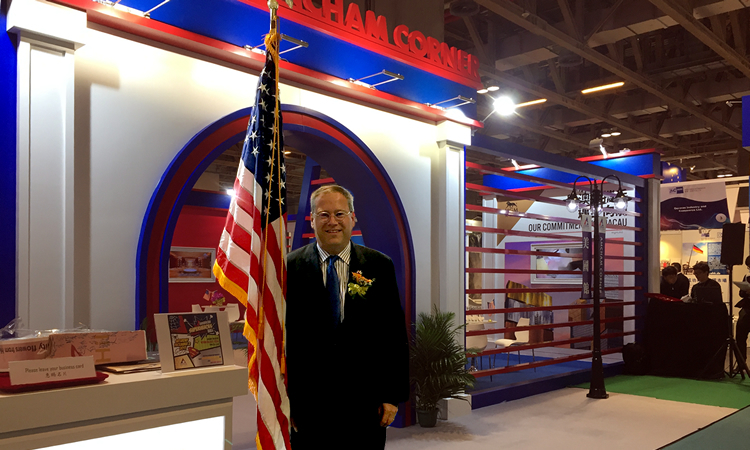 U.S. Consul General Kurt Tong opened the U.S. Pavilion at the Macau International Environment Co-operation Forum & Exhibition (MIECF) on March 30, 2017. 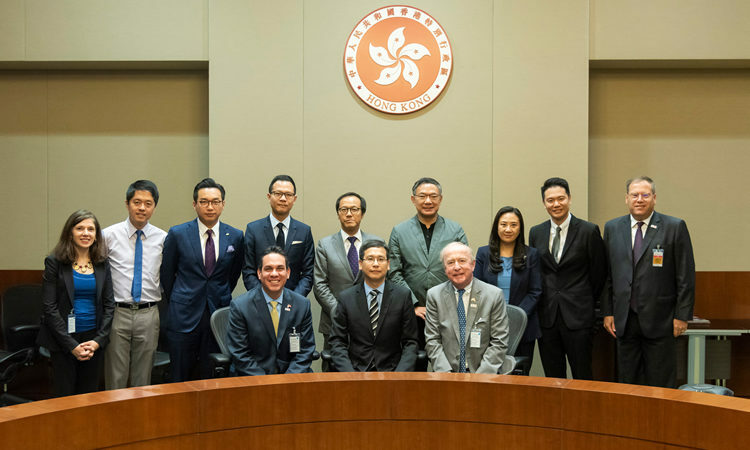 On March 20, Consul General Tong met with local leaders who advocate for the rights of ethnic minorities in Hong Kong to hear about some of the issues of concern to ethnic minority populations in Hong Kong. 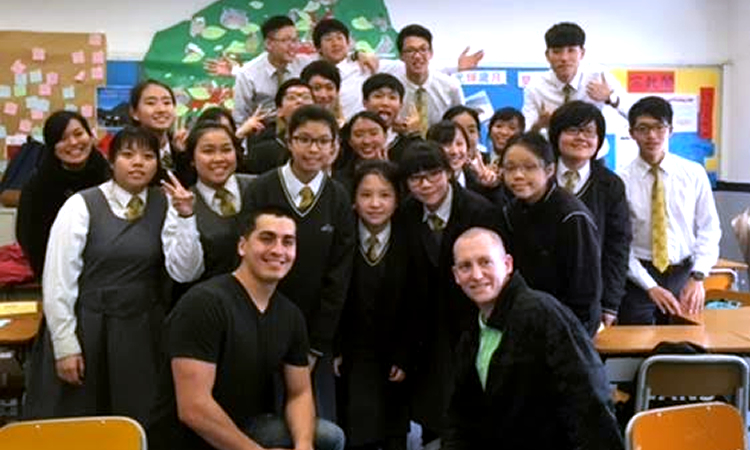 The International Day for the Elimination of Racial Discrimination is observed annually on March 21. 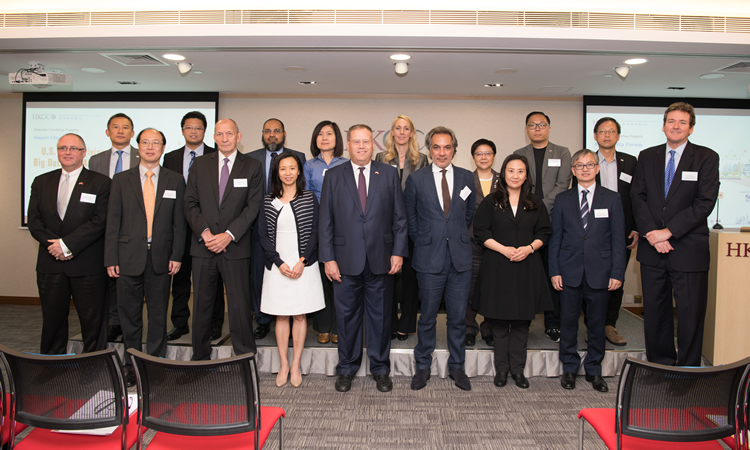 The Consul General opened the first Asia Regional Intellectual Property Rights Criminal Enforcement Workshop on March 8, 2017, organized in partnership with the Hong Kong Customs and Excise Department and the U.S. 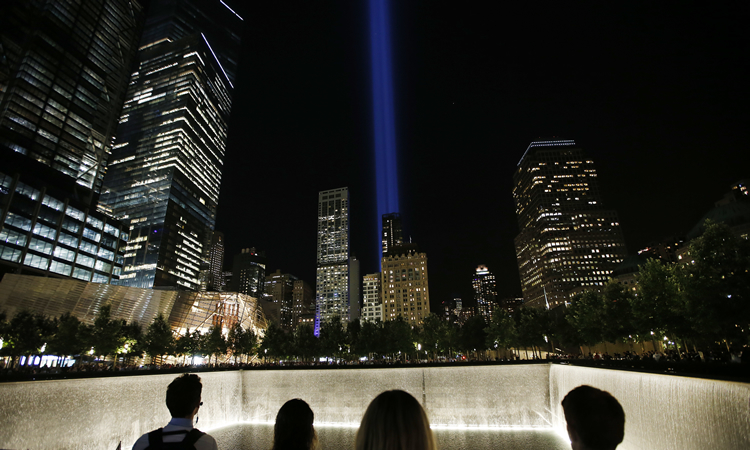 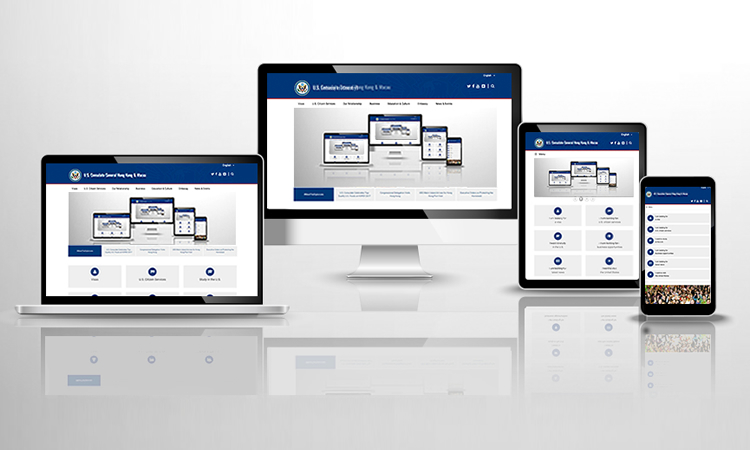 Homeland Security Investigations and Customs and Border Protection agencies. 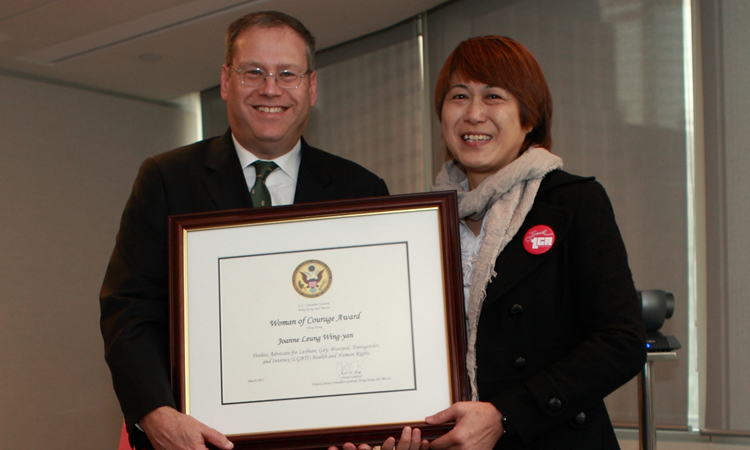 On March 7, Consul General Tong presented the U.S. Consulate General's nominee for International Woman of Courage Award, Joanne Leung, with a certificate in recognition of the work she has done as a supporter of the Lesbian, Gay, Bisexual, Transgender, and Intersex (LGBTI) community in Hong Kong. 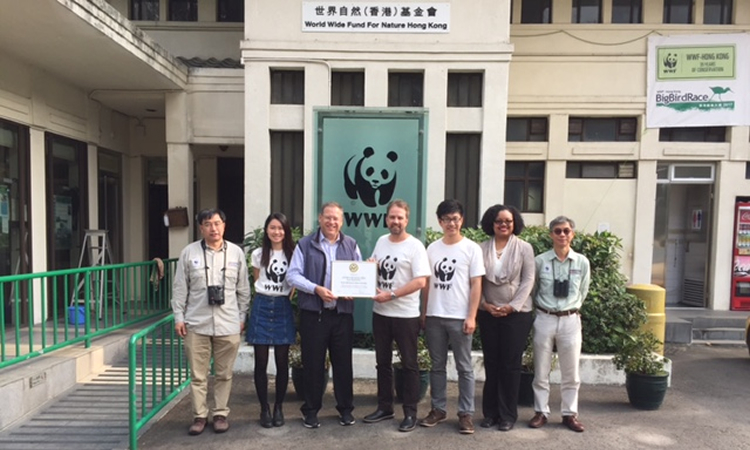 Mar 3, 2017 - In celebration of World Wildlife Day, Consul General Kurt Tong visited Hong Kong's Mai Po Nature Reserve where mammals, reptiles, insects, and over 350 species of birds live under the care of the World Wildlife Fund. 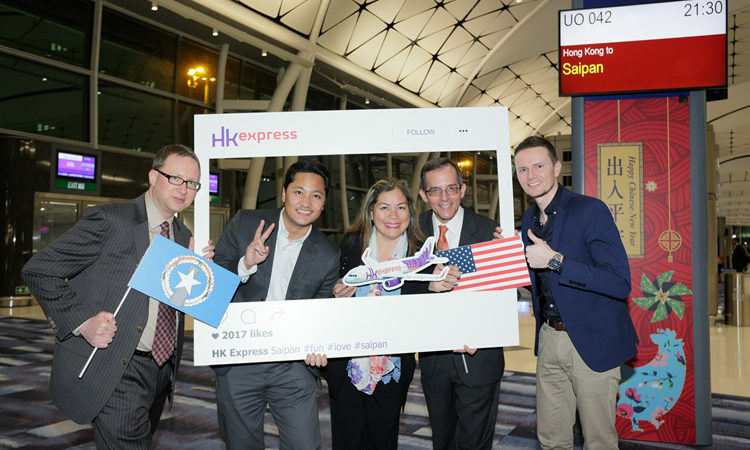 HK Express began non-stop service to the U.S. territory of Saipan on January 17, 2017. 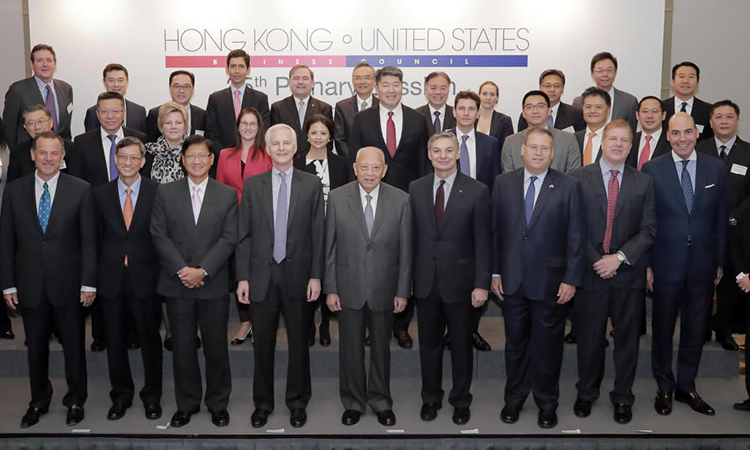 Consul General Tong met with the Hong Kong-U.S. Business Council (HKUSBC) at its plenary meeting on January 16-17, 2017. 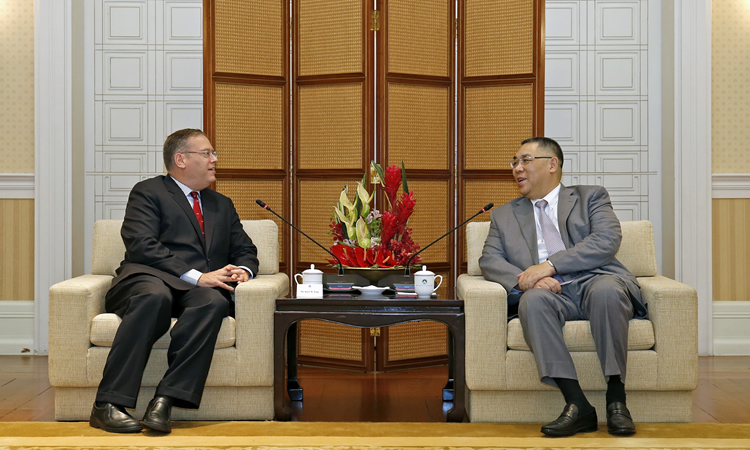 December 19, 2016 – In a year-end interview with the Hong Kong Economic Journal, CG Kurt Tong talked about the strong trade and investment relationship between the U.S. and Hong Kong, and called for further cooperation in finance, on technological innovation, and on education. 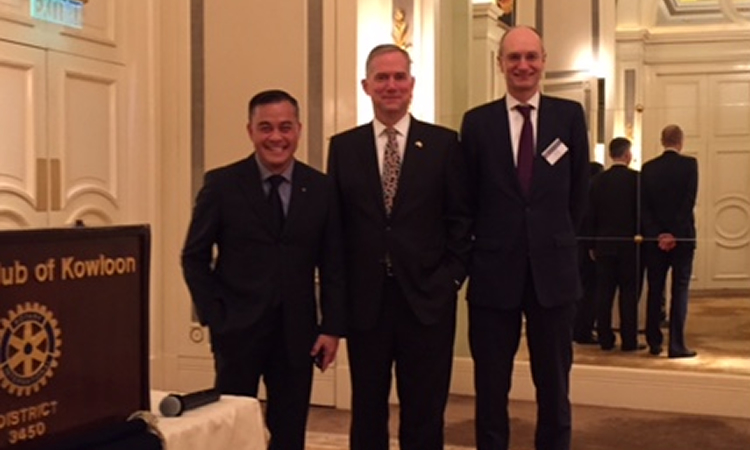 On December 14, 2016, U.S. and Macau SAR signed an inter-governmental agreement to facilitate the compliance of Macau financial institutions with the U.S. Foreign Account Tax Compliance Act (FATCA). 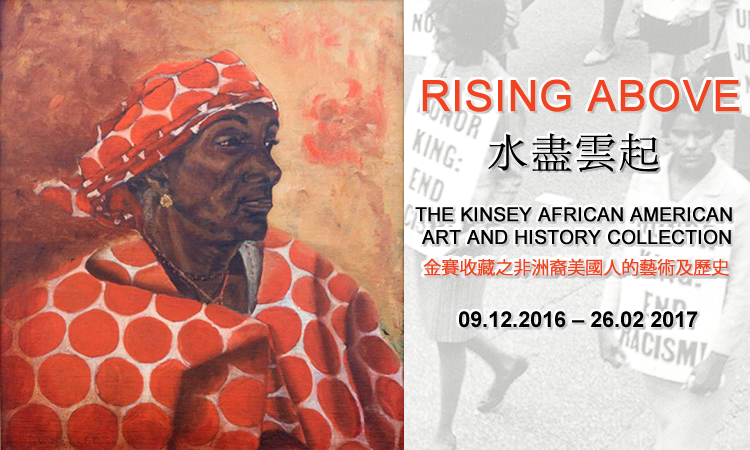 CG Tong spoke at the opening of "Rising Above: The Kinsey African American Art and History Collection" on December 8, 2016. 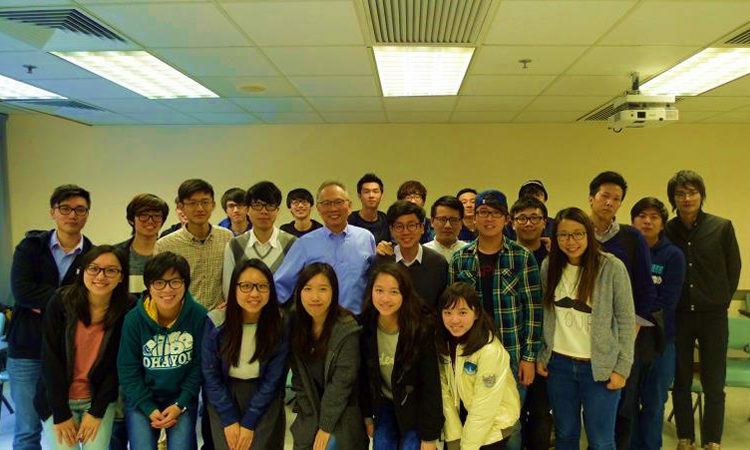 CG Tong delivered a speech titled, "United States and Hong Kong: Collaborating for an Innovative Future" to students at Hong Kong Polytechnic University on December 2, 2016. 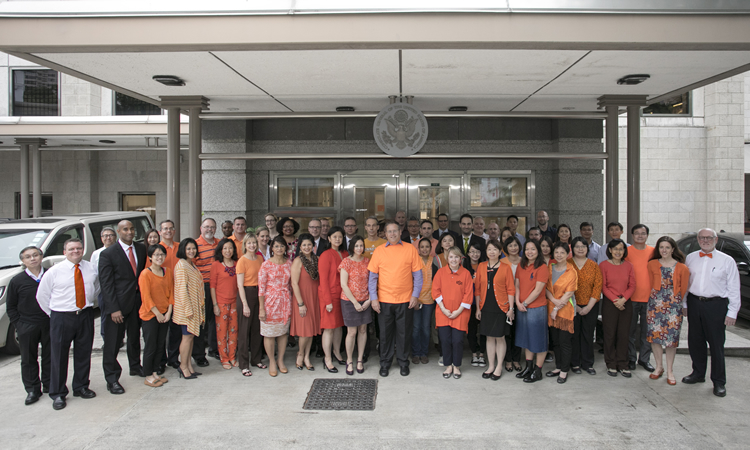 November 21, 2016 - In November, the Consulate General commemorated the International Day for the Elimination of Violence Against Women and launched the 16 Days Against Gender Based Violence Campaign. 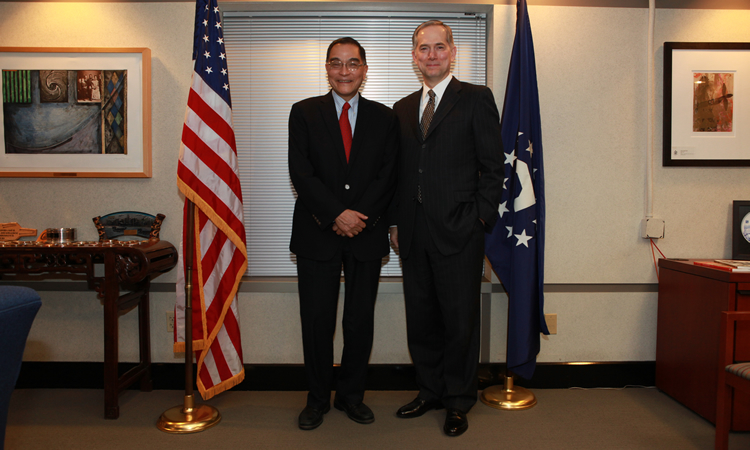 CG Tong met with Macau Chief Executive Fernando Chui for the first time October 24, 2016. 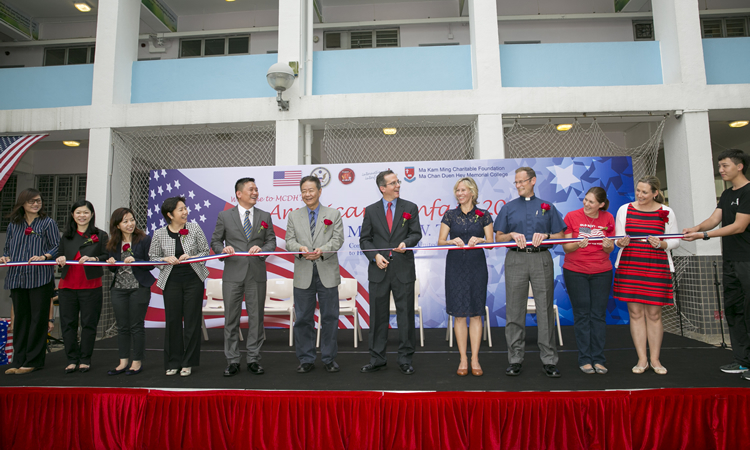 On October 14, 2016, Deputy Consul General Thomas Hodges inaugurated the Ma Chan Duen Hey Memorial College’s (MCDH) annual American Fun Fair. 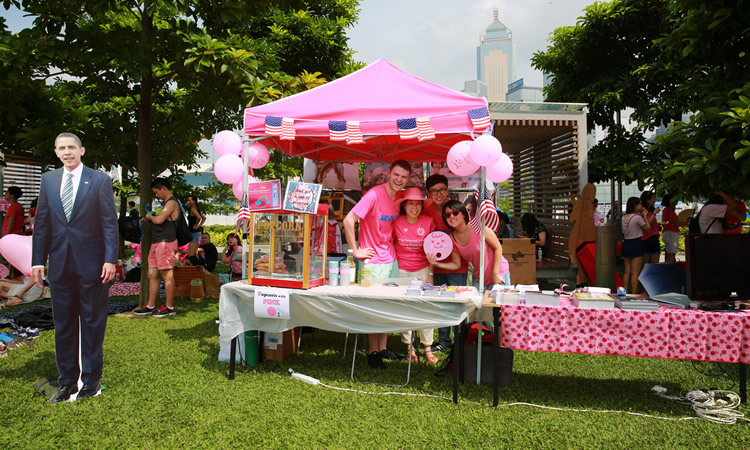 The U.S. Consulate General was represented at a booth at Hong Kong’s Pink Dot Festival on September 28, 2016. 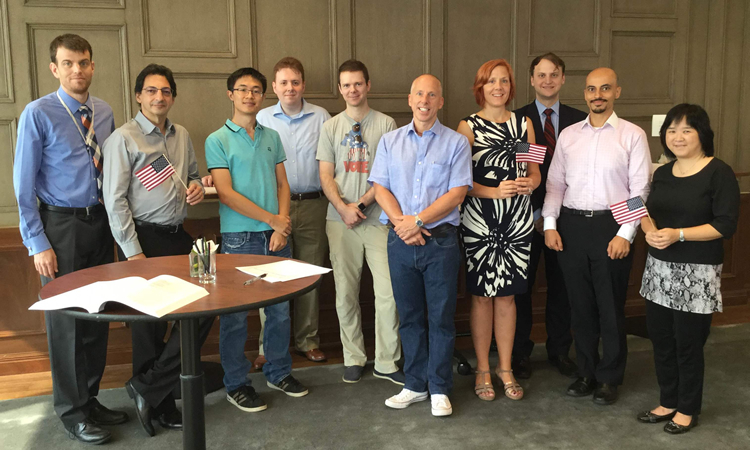 August 26, 2016 - The Consulate General’s American Citizen Services (ACS) Unit, with the support of Democrats Abroad and Republicans Overseas, held a three-hour nonpartisan “American Voter Registration Event” at the American Club in Central. 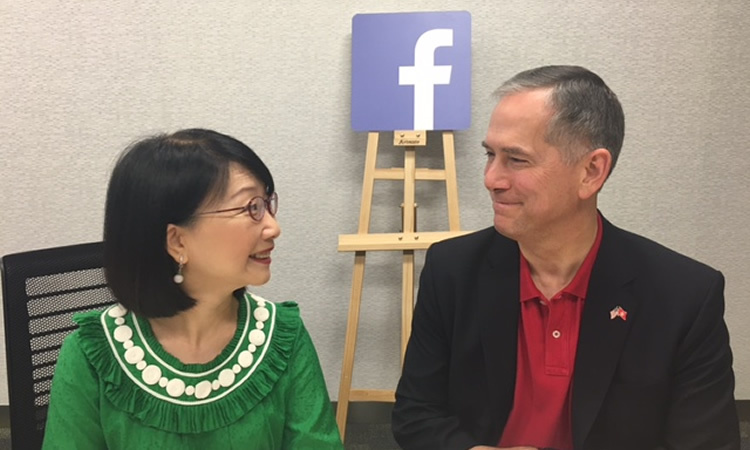 Consul General Hart conducted his first-ever Facebook Live chat on July 12, 2016 with JA Asia Pacific’s Vivian Lau as moderator. 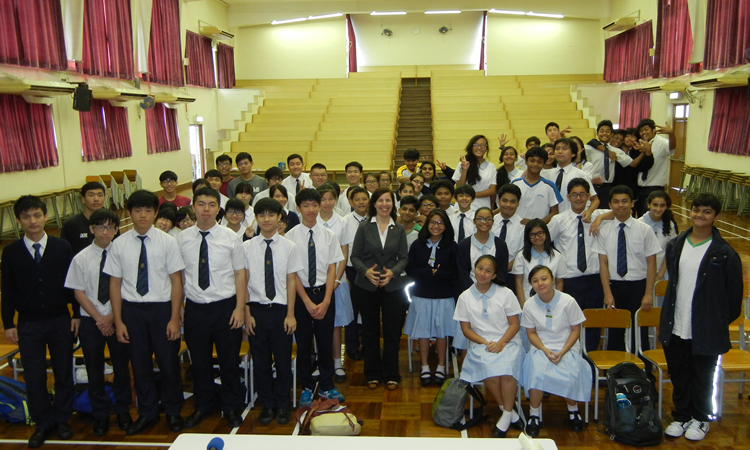 June 2, 2016 - EducationUSA partnered with Professor Steve Deyrup, a visiting chemistry and biochemistry professor from Siena College, to conduct an outreach talk for students at Shatin College. 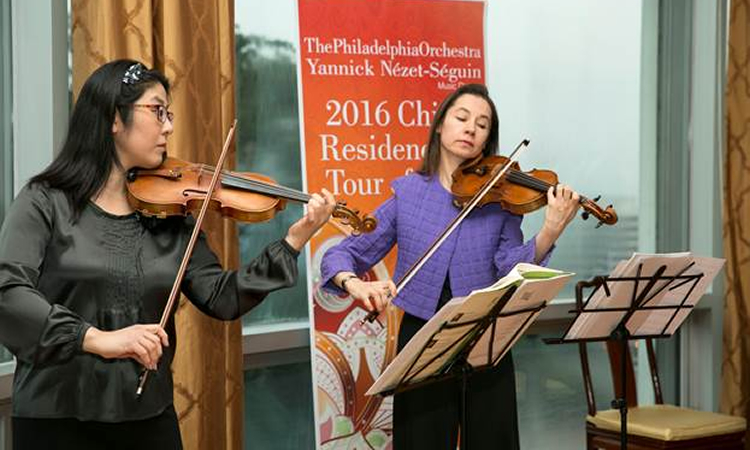 May 28, 2016 - The U.S. Consulate welcomed the Philadelphia Orchestra back to Hong Kong and Macau. 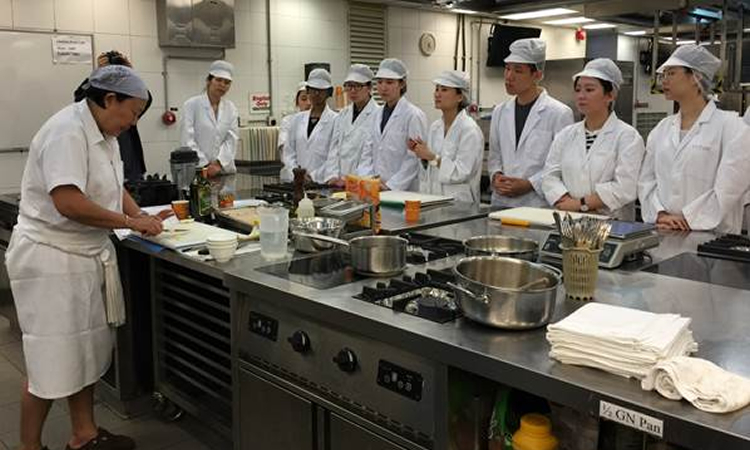 May 27, 2016 - U.S. Consulate General Hong Kong and Macau partnered with Asia Society Hong Kong to bring famous Chinese-American chef Anita Lo to Hong Kong. 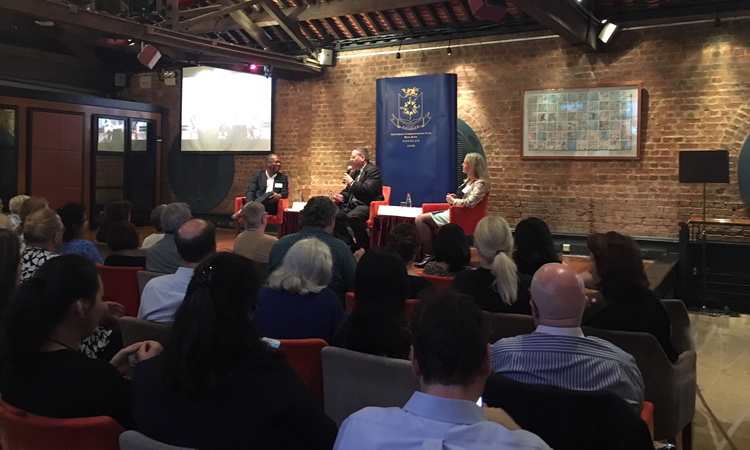 April 14, 2016 - Consul General Clifford A. Hart, Jr. spoke at the Kowloon Rotary Club. 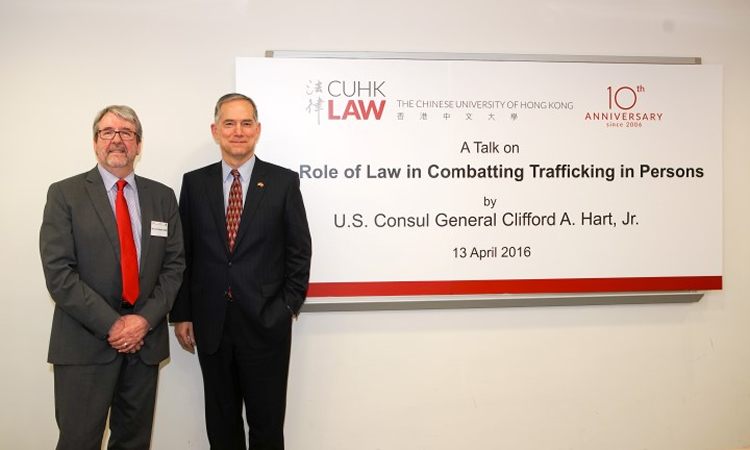 April 13, 2016 - Consul General Clifford A. Hart, Jr. spoke at the Law School of the Chinese University of Hong Kong. 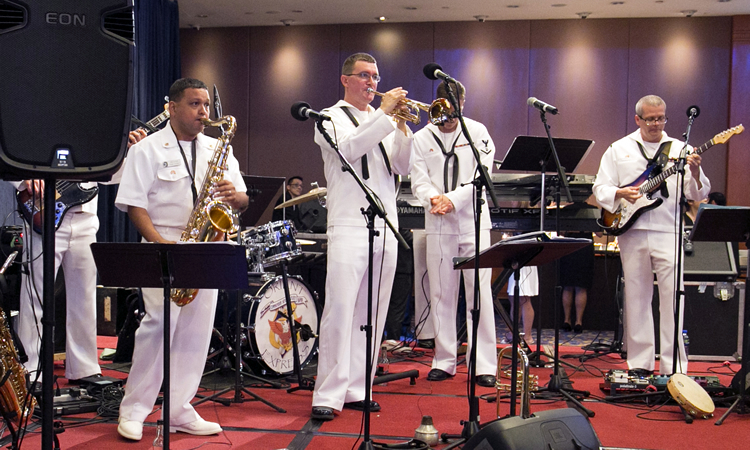 March 23, 2016 - U.S.S. 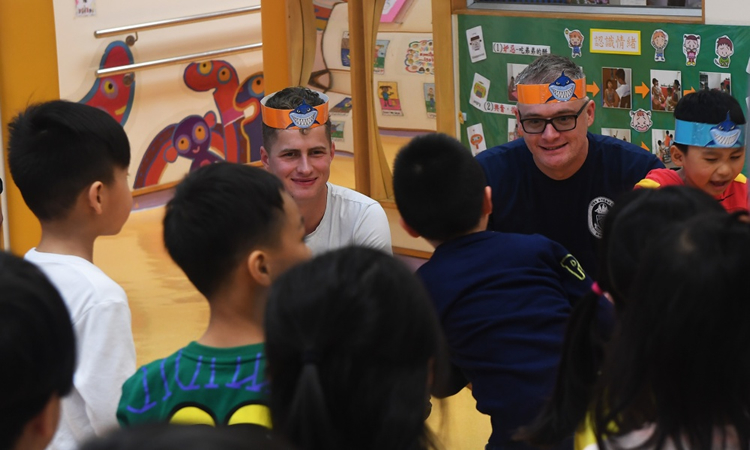 Boxer came to port in Hong Kong, the U.S. crew took the opportunity to spend some of their visit interacting with local students and engaging in cultural exchange. 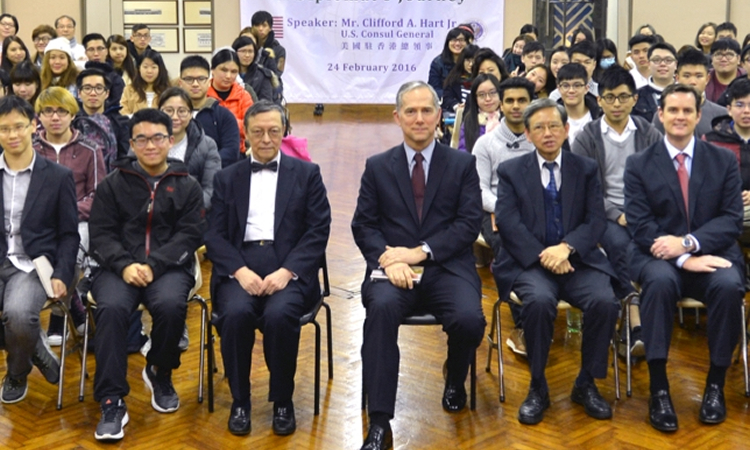 February 24, 2016 - CG Hart shared his own “Diplomat’s Journey” in a speech at the Chu Hai College of Higher Education. 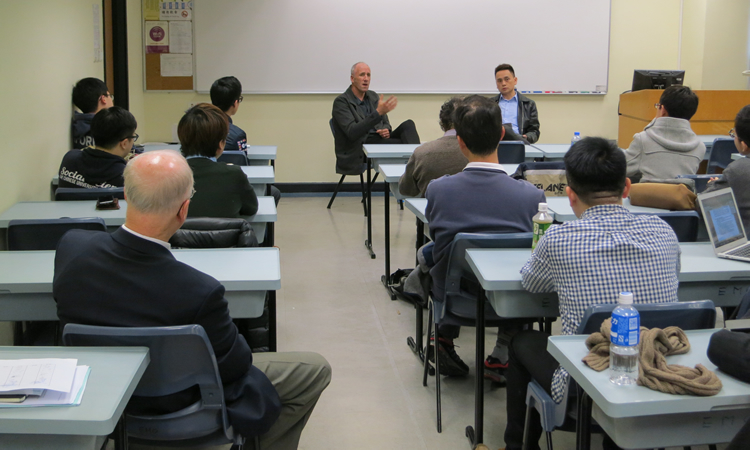 February 22, 2016 - The Consulate arranged for American filmmaker David Holbrooke to speak at the Chinese University of Hong Kong. 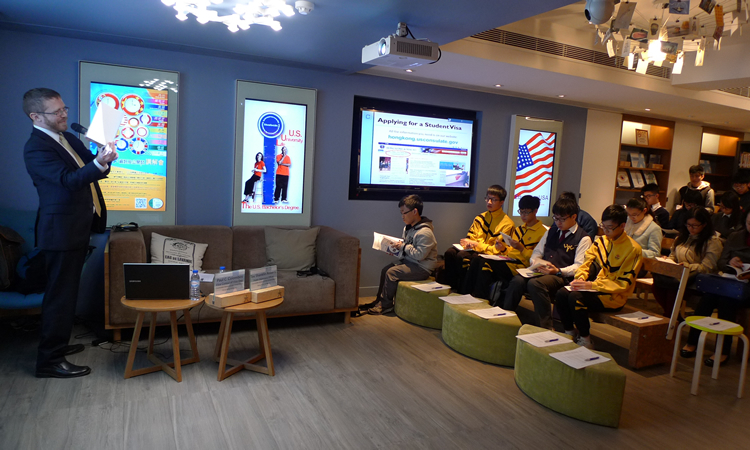 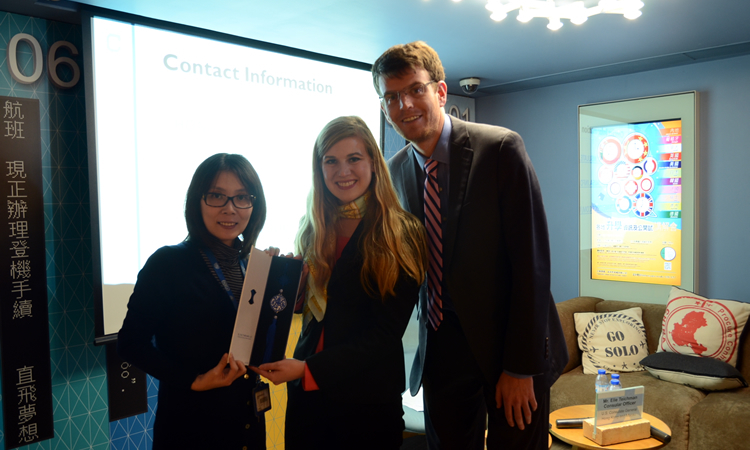 February 19, 2016 - EducationUSA introduced the U.S. university admissions process at the Macau Tertiary Education Services’ annual overseas seminar. 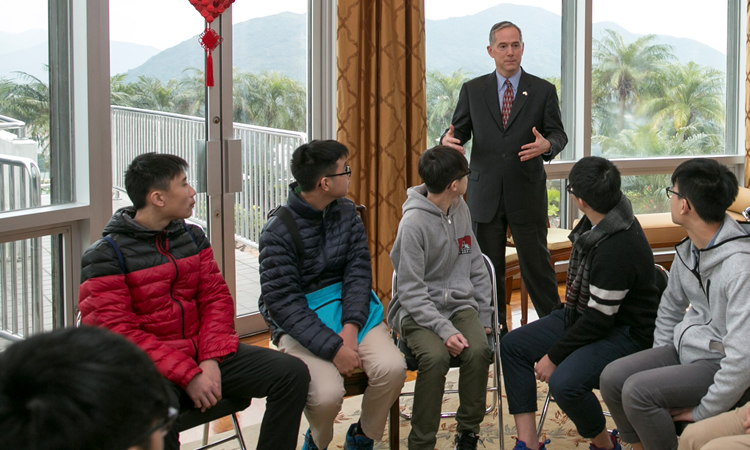 February 17, 2016 - CG Hart, Jr. hosted a Lunar New Year reception for 30 students from Ma Chan Duen Hey Memorial College. 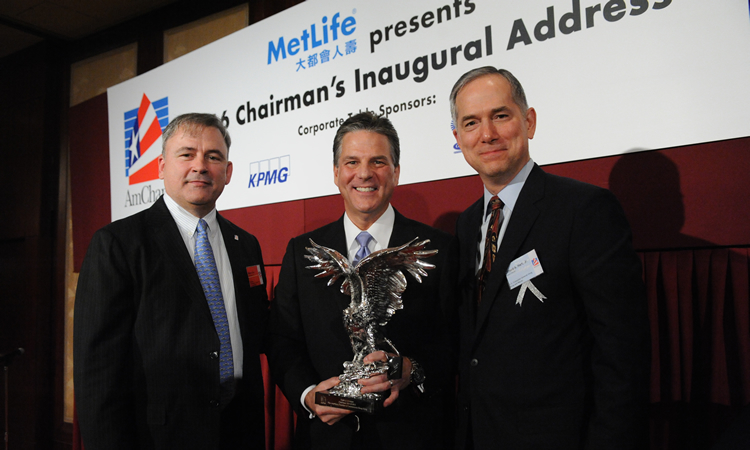 January 22, 2016 - CG Hart spoke at the Hong Kong AmCham’s annual inaugural address and ceremony for its new Chairman. 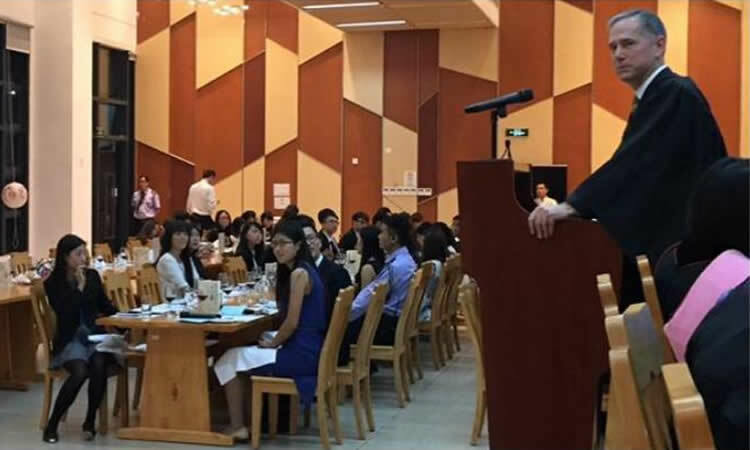 November 10, 2015 - Consul General Hart spoke to a crowd of undergraduates at the University of Macau. 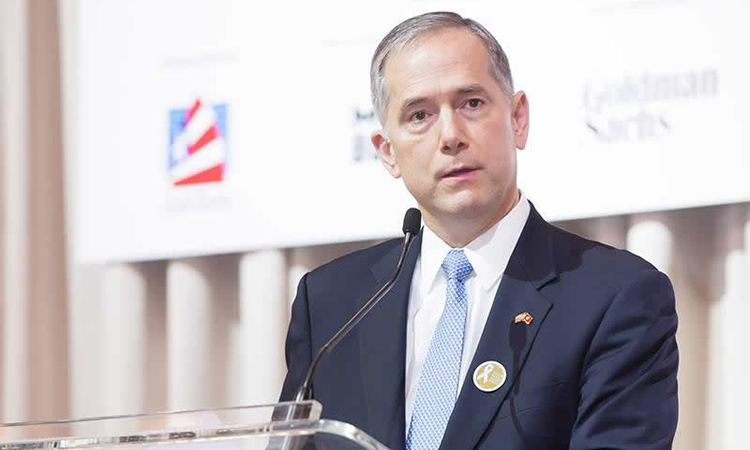 November 6, 2015 - CG Hart attended the 12th annual AmCham Women of Influence Conference on where he was invited to give remarks before the awards ceremony. 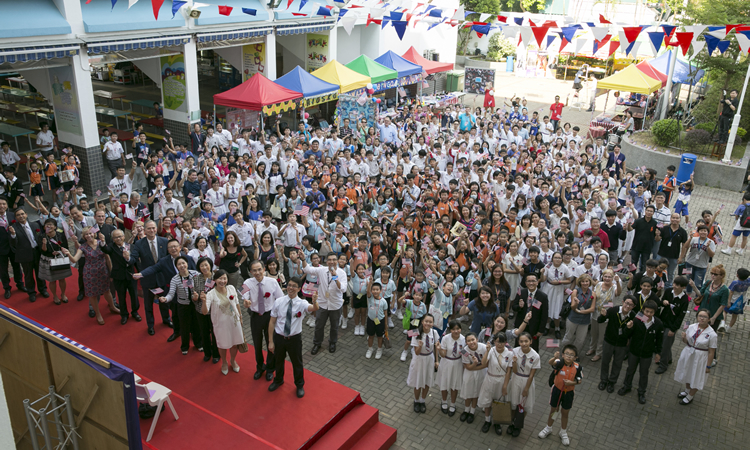 on October 23-25, 2015 - Ma Chan Duen Hey Memorial College hosted the annual 3-day American Fun Fair to promote American culture and English learning. 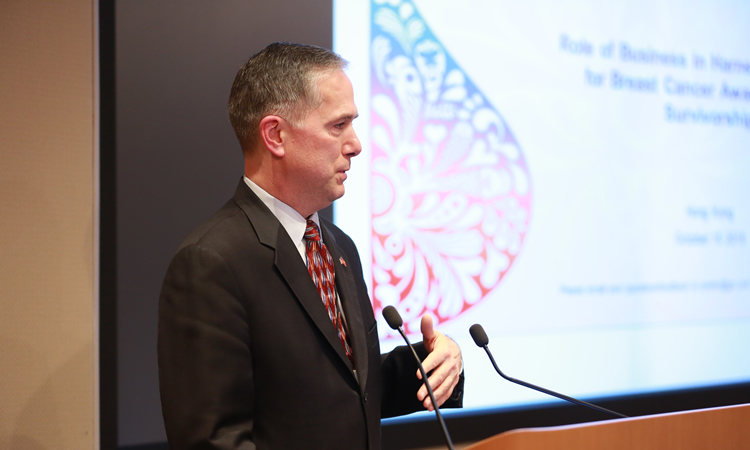 October 15, 2015 - CG Hart spoke at a breast cancer awareness event hosted by Goldman Sachs as part of the firm's initiative to raise awareness about the disease and support the Chinese government's priority in two-cancer screening. 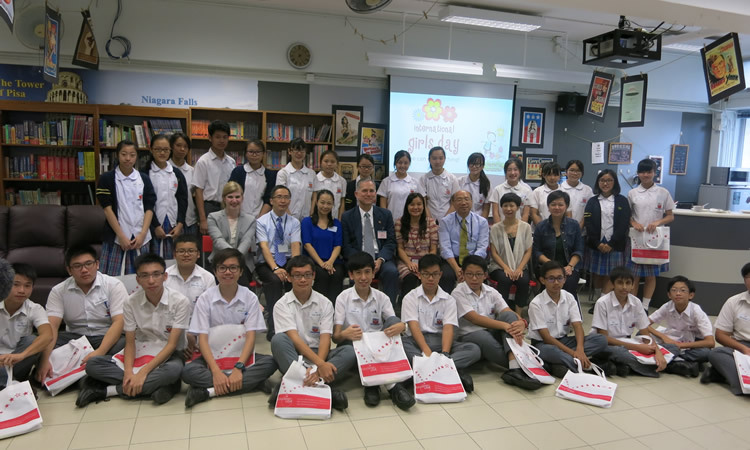 October 9, 2015 - CG Hart visited HKMA K S Lo College in collaboration with The Women's Foundation to recognize the International Day of the Girl Child. 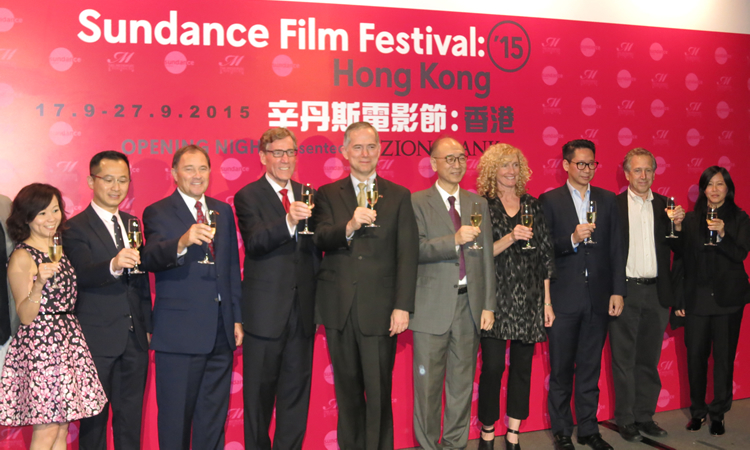 September 17-27, 2015 - The Sundance Film Festival came to Hong Kong for its second year hosted by a major local cinema with support from the State of Utah. 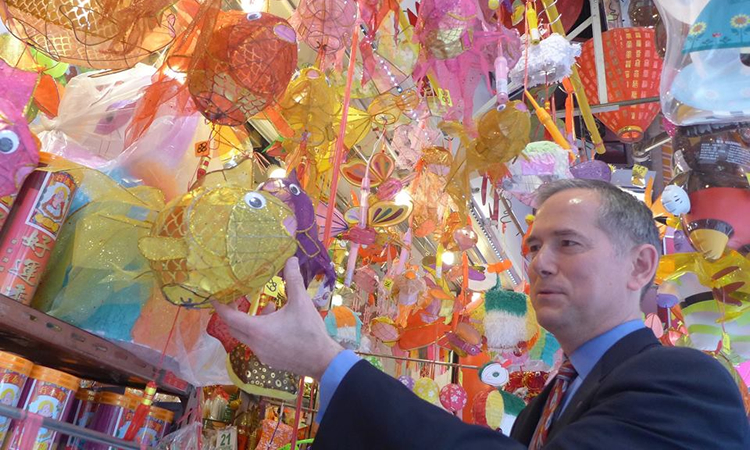 September 25, 2015 - CG Hart took part in some local traditions in preparation for the Mid-Autumn festival. 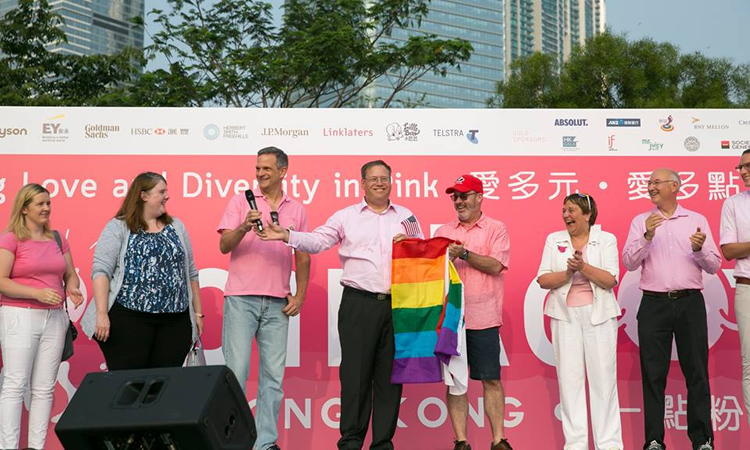 September 20, 2015 - CG Hart attended the Pink Dot festival in Hong Kong in support of the LGBTI community. 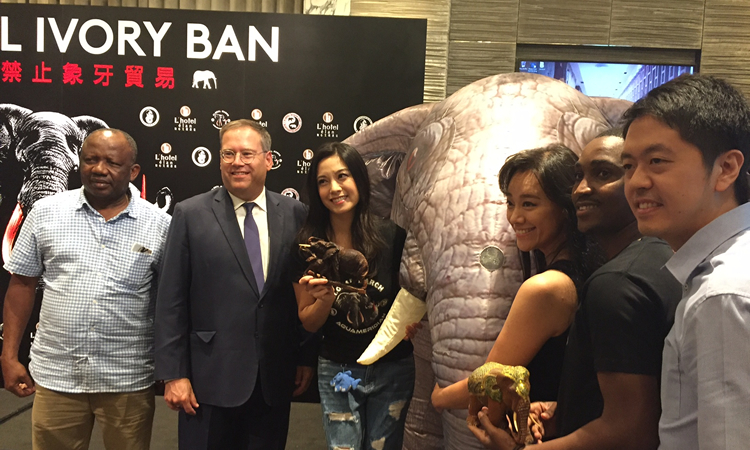 August 28, 2015 - CG Hart visited the Yu Lan Cultural Festival. 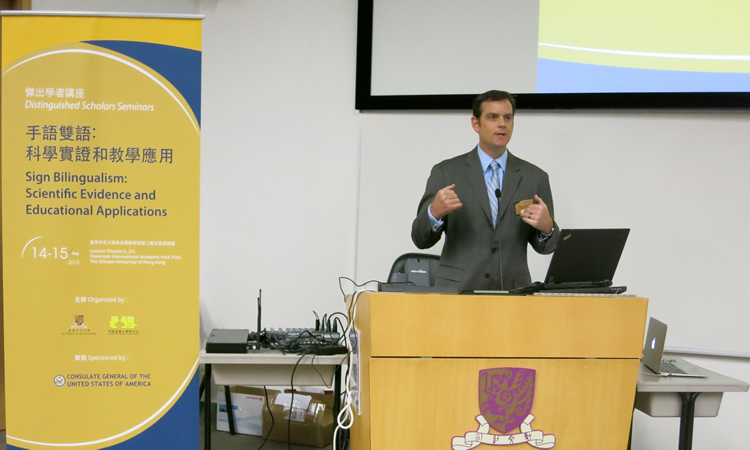 August 14, 2015 - Acting Consul General Tom Cooney gave opening remarks at the Sign Bilingualism and Deaf Education Seminar Series organized by The Chinese University of Hong Kong Center for Sign Linguistics and Deaf Studies. 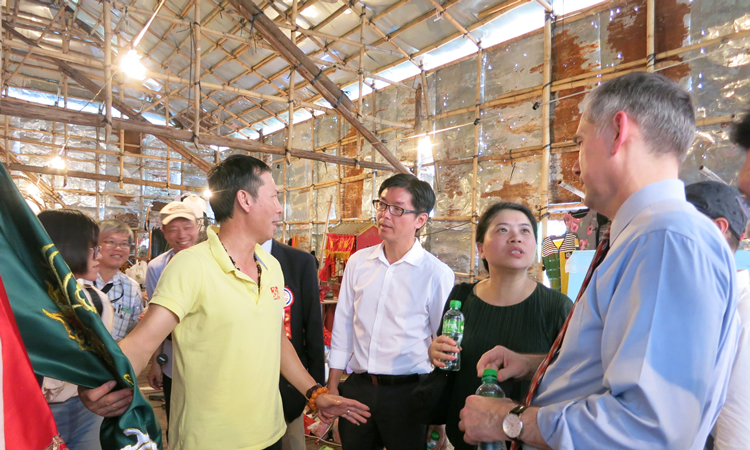 July 22, 2015 - CG Hart visited Shek Kip Mei, an historic district integral to the history of Hong Kong. 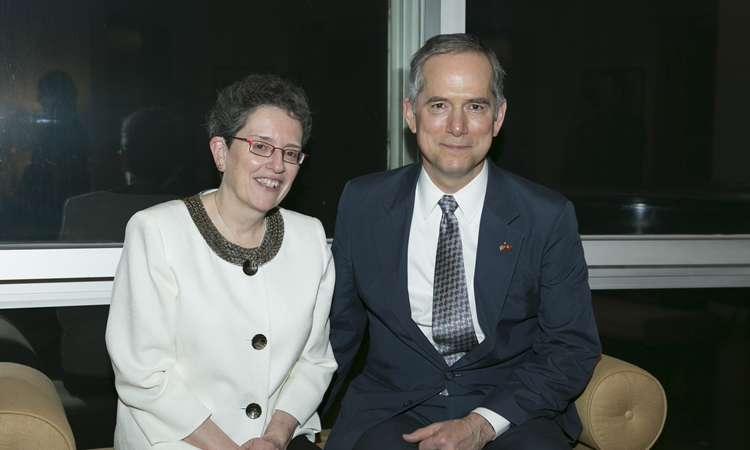 July 21, 2015 - The Consulate helped organize a series of events for former Assistant Secretary for Consular Affairs and current President and CEO of the International Center for Missing & Exploited Children, Ambassador Maura Harty. 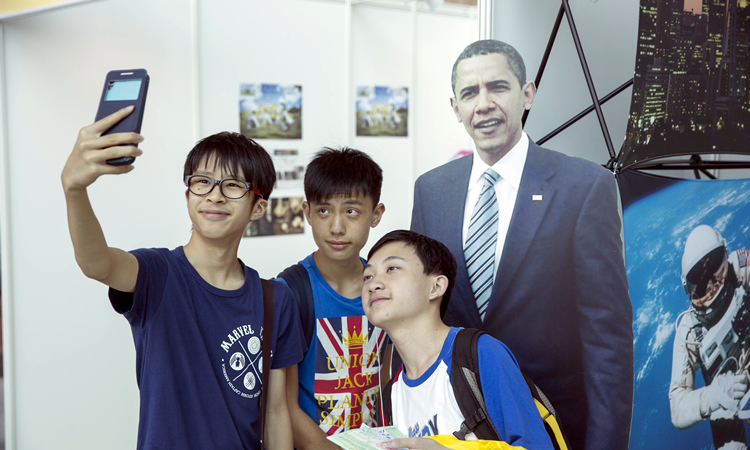 July 15, 2015 - The Consulate hosted a booth at the 26th Hong Kong Book Fair, sharing U.S. government publications, posters, and EducationUSA materials, and answering student visa and college application questions. 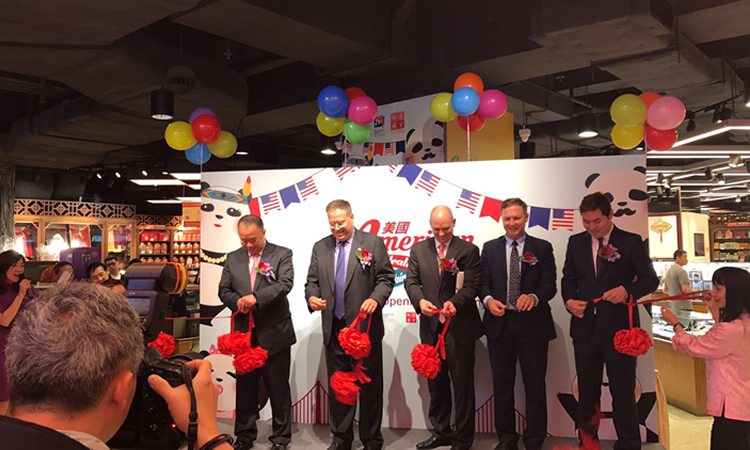 June 30, 2015 - The Consulate General held its annual Independence Day receptions in Macau and Hong Kong on June 26 and June 30, respectively. 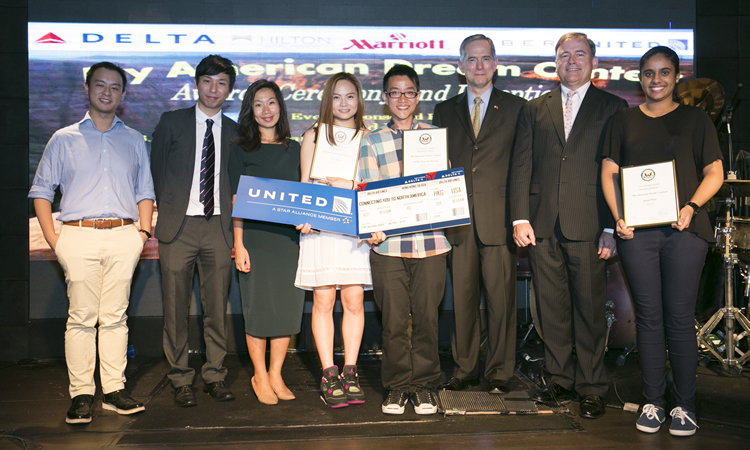 June 24, 2015 - The Consulate recently hosted the awards ceremony and reception to announce the winners of the 2015 My American Dream Contest. 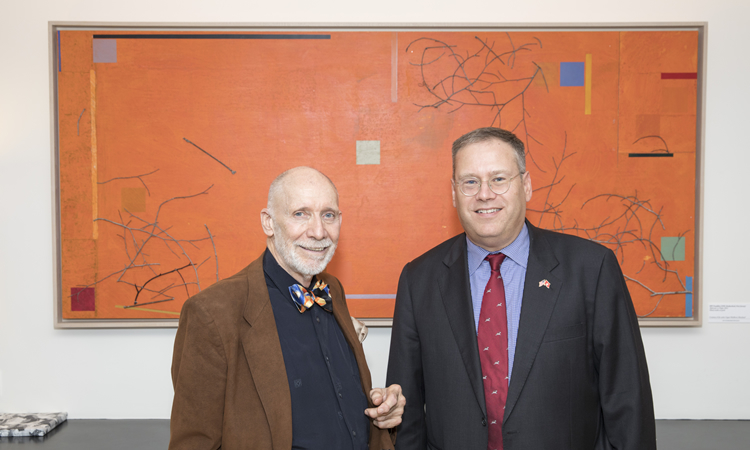 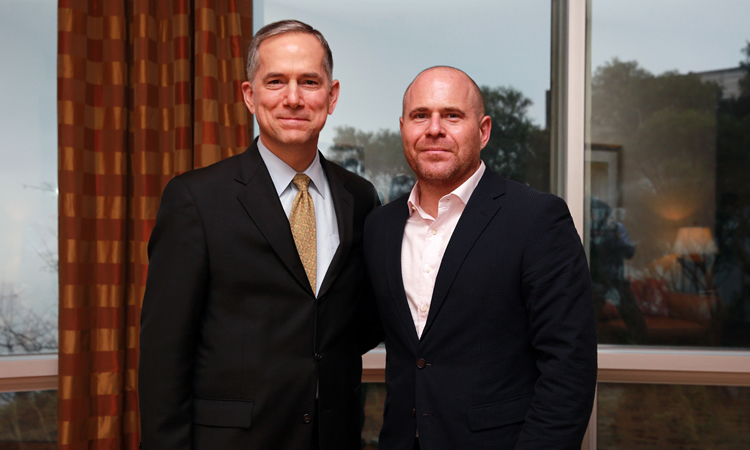 Tom Cochran, Deputy Coordinator of Platforms for the State Department's Bureau International Information Programs, visited Hong Kong from June 17-21, 2015. 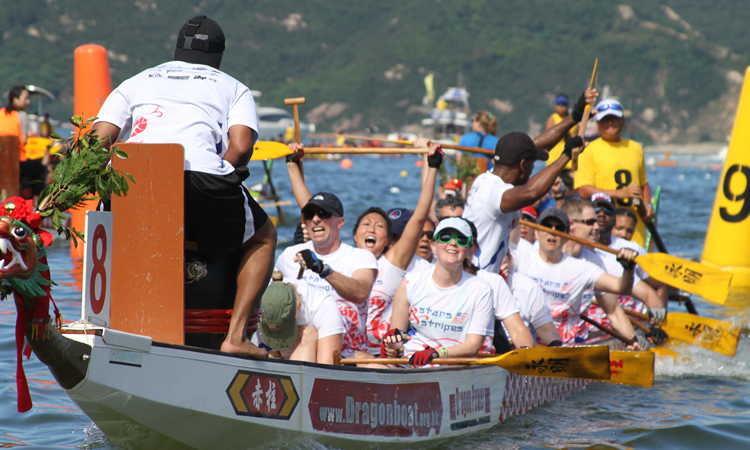 June 20, 2015 - CG Hart spoke to thousands of spectators and participants at the Stanley International Dragon Boat Championships. 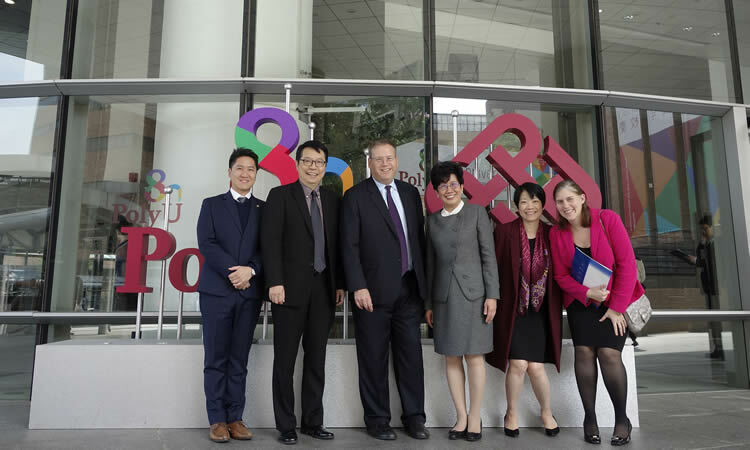 Science Fellow Penny McDaniel of the EPA gave presentations at the AmCham, think tank Civic Exchange, and the Consulate from June 16-26, 2015, about USG efforts to improve air quality by controlling emissions from ships and ports. 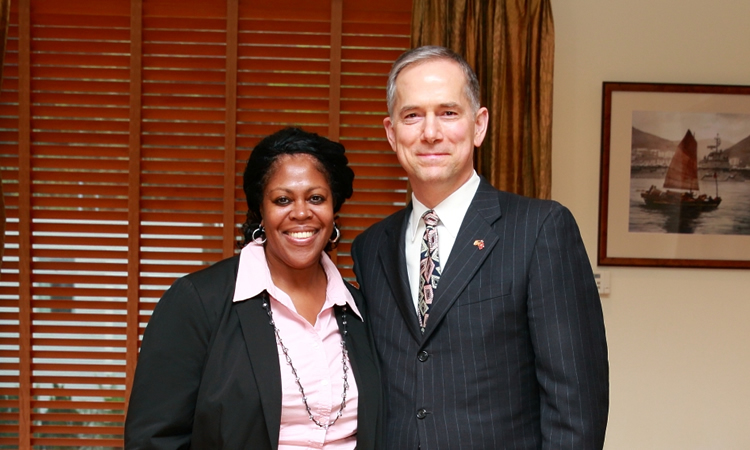 June 16, 2015 - The Consulate recently hosted a reception honoring the 100,000 Strong Foundation and its diversity outreach efforts. 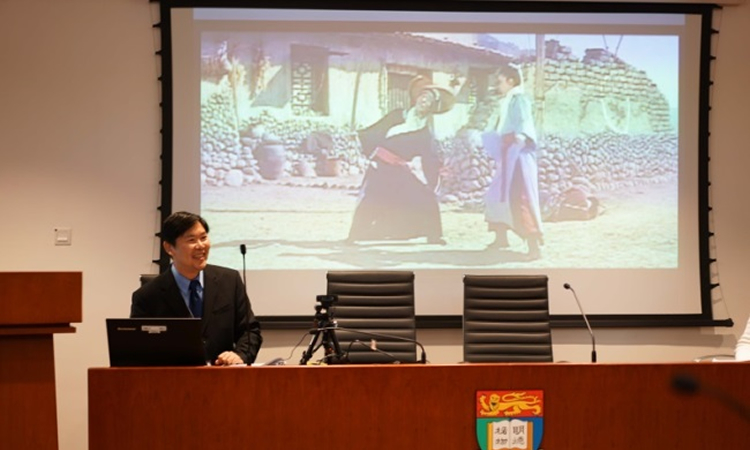 May 31, 2015 - U.S. Fulbright scholar George Wang co-organized a two-day American film studies conference at Hong Kong University. 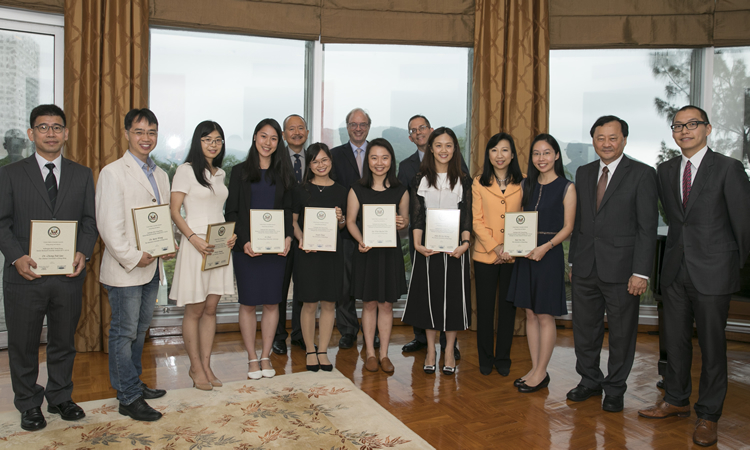 May 20, 2015 - CG Hart, Jr. hosted a musical soiree at his residence in honor of three beneficiaries of the Hong Kong Next Generation Arts Musical Angel Program. 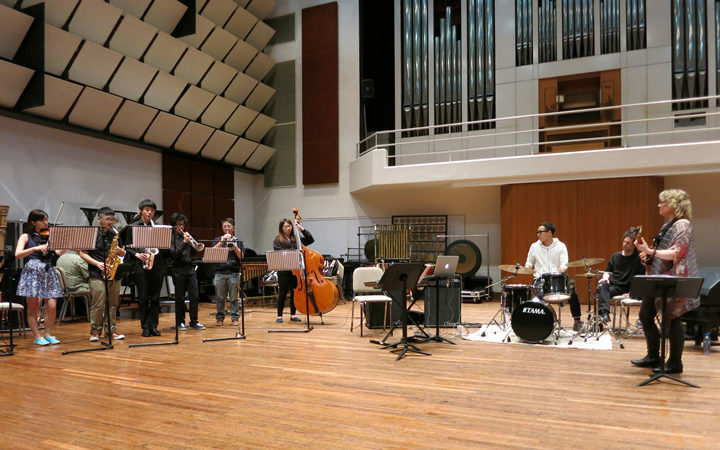 April 29, 2015 - In celebration of Jazz Appreciation month and International Jazz Day, the Consulate collaborated with the Hong Kong Arts Centre, the Hong Kong Academy of Performing Arts, and the Hong Kong Polytechnic University to organize a series of jazz outreach programs featuring the Sheryl Bailey Three. 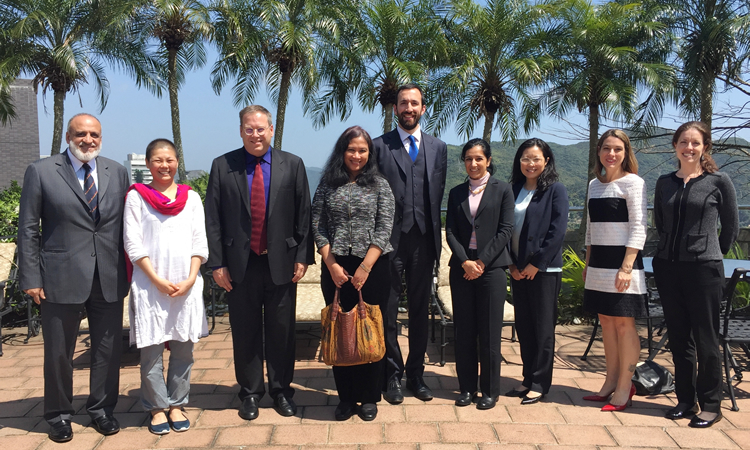 April 27, 2015 - The Consulate partnered with the Hong Kong Women's Foundation to organize a series of outreach talks featuring Gender Lens Investing expert Joy Anderson to discuss the benefits of increasing female participation in the private sector. 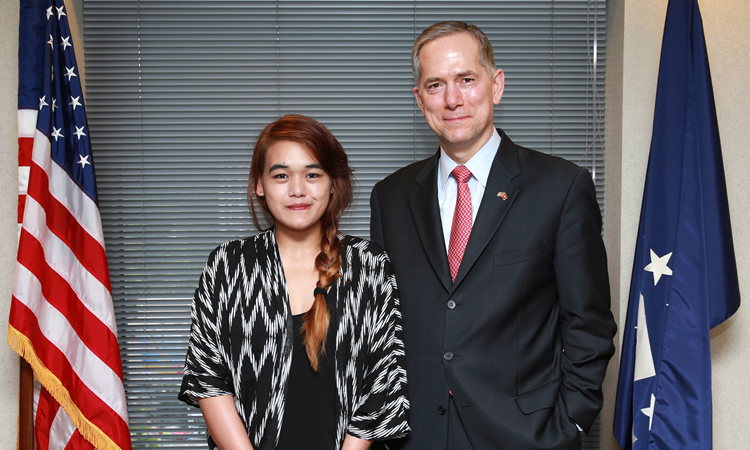 April 22, 2015 - CG Hart recently invited acclaimed Hong Kong based photographer Xyza Cruz Bacani to the Consulate General to discuss her work and scholarship to study at New York University this summer. 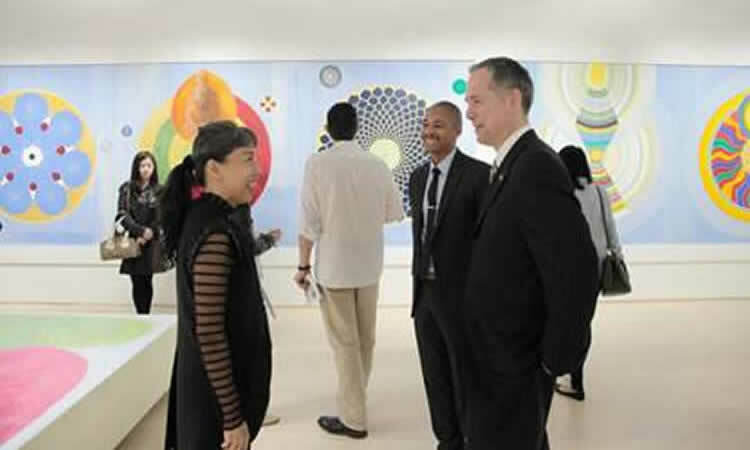 April 12, 2015 - CG Hart and Public Diplomacy Officer Tau Shanklin Roberts attended the opening of a Hong Kong exhibition by accomplished Chinese-American and Art in the Embassies artist Emily Cheng. 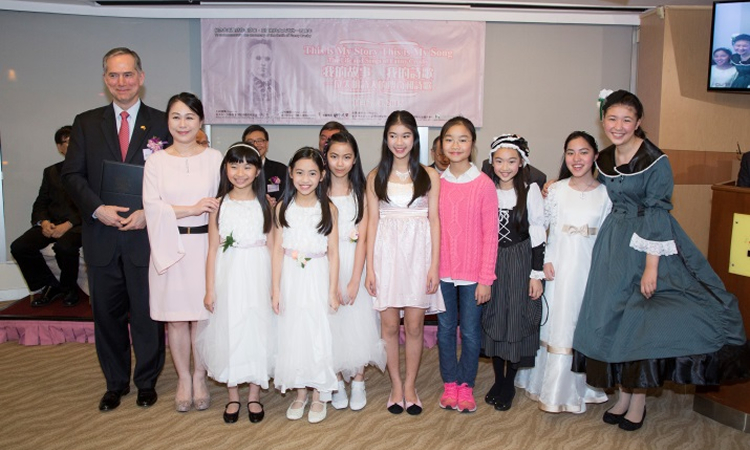 April 11, 2015 - CG Hart gave remarks at the opening ceremony for a concert entitled "This is My Story, This is My Song: The Life and Songs of Fanny Crosby" at the Hong Kong Cultural Centre Concert Hall. 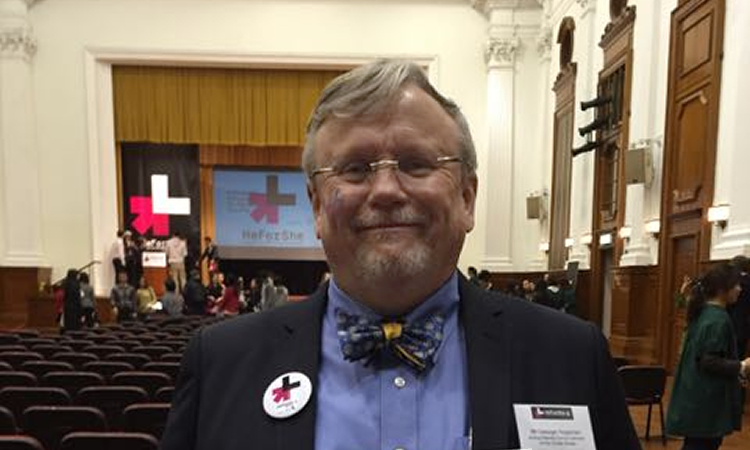 April 10, 2015 - Consular Chief George Hogeman attended the launch event for Hong Kong University's commitment to the United Nations' HeForShe gender equality initiative. 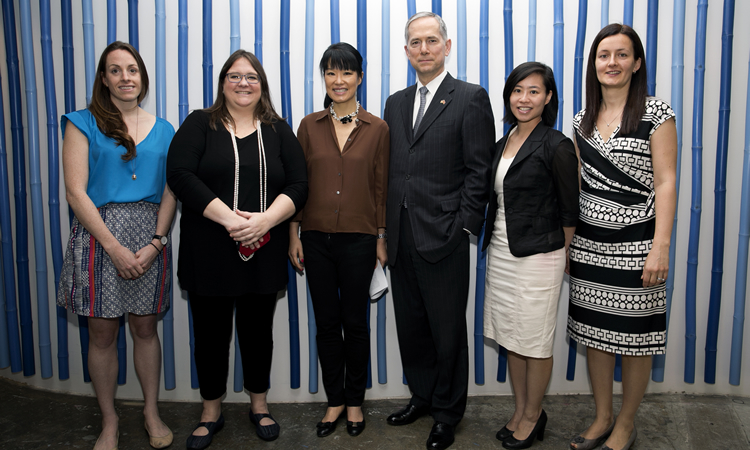 March 16, 2015 - CG Hart hosted a reception to honor the more than 40 U.S. galleries participating in Art Basel Hong Kong 2015. 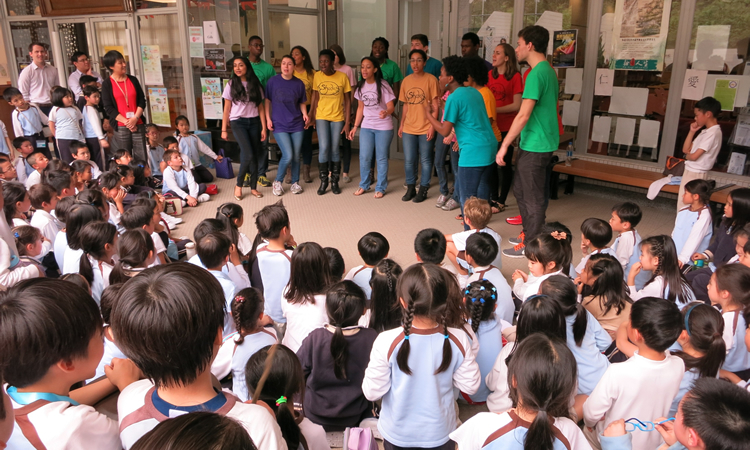 March 16, 2015 - Shades of Yale performed music of the African diaspora and African-American tradition on for over 500 primary and secondary school students at Independent Schools Foundation Academy in Hong Kong. 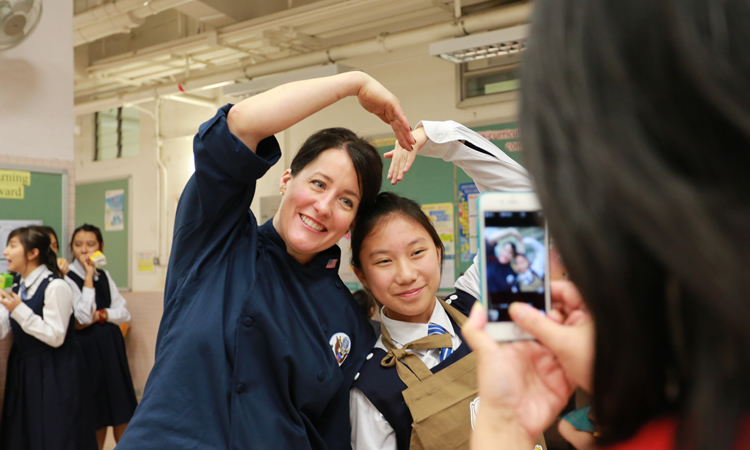 March 2, 2015 - Chef Pomeroy met with fifty high school home economics students at Tak Nga Catholic Girls School in Sham Shui Po, Kowloon. 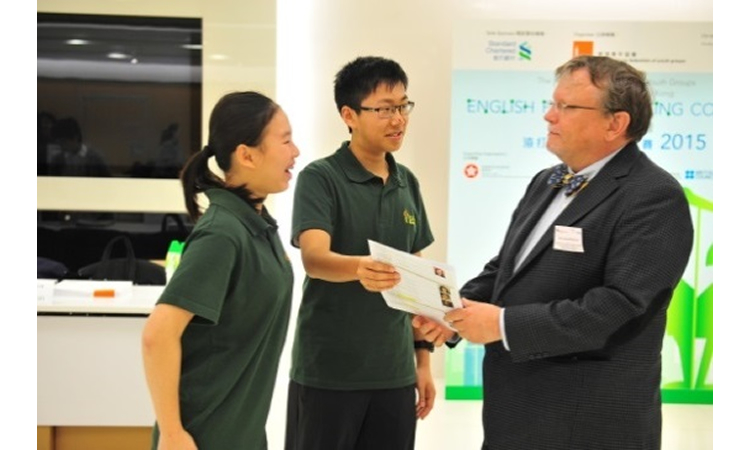 February 28, 2015 - Consular Chief George Hogeman was Question Master for the finals of the 12th annual Hong Kong Federation of Youth Groups English Public Speaking Contest. 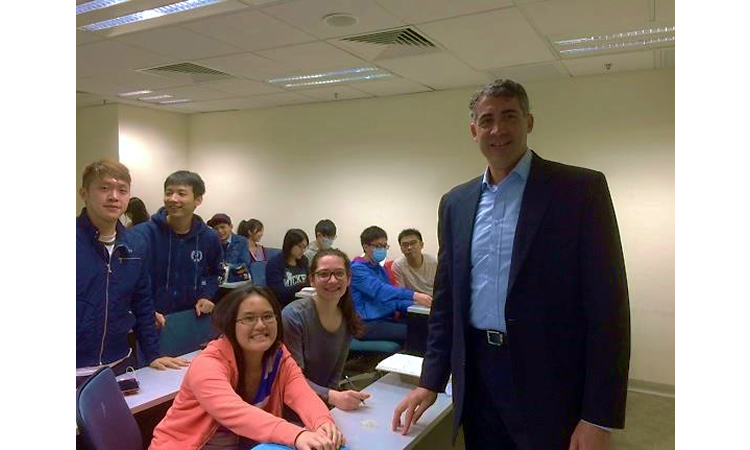 February 25, 2015 - DEA Attaché Andrew Malanga gave a guest lecture on transnational drug crime to criminology students at City University of Hong Kong. 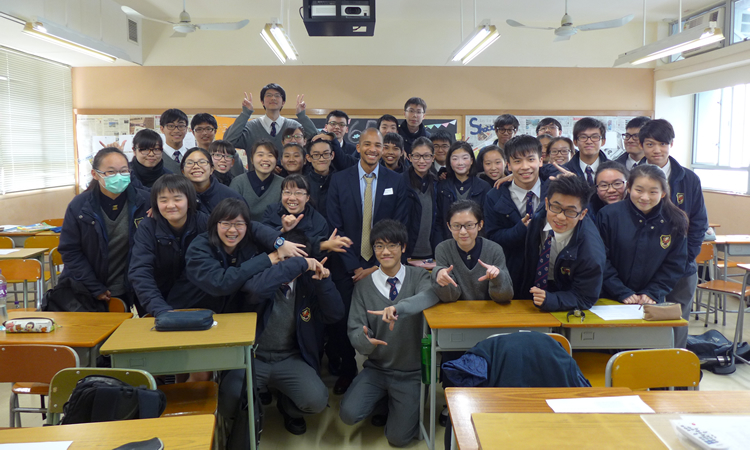 February 10, 2015 - Assistant Information Officer Tau Shanklin Roberts led a discussion about the American biopic period drama film The Great Debaters at St. Mark's School in Hong Kong's Eastern District. 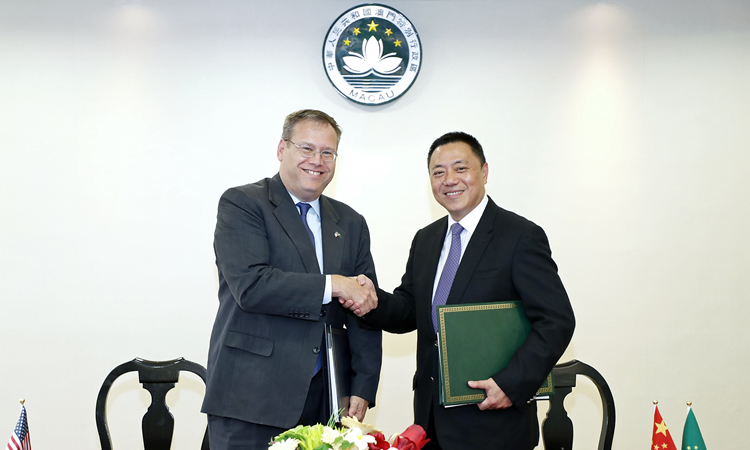 February 6, 2015 - CG Hart met with Professor Feng, the new Director of Global Affairs of University of Macau. 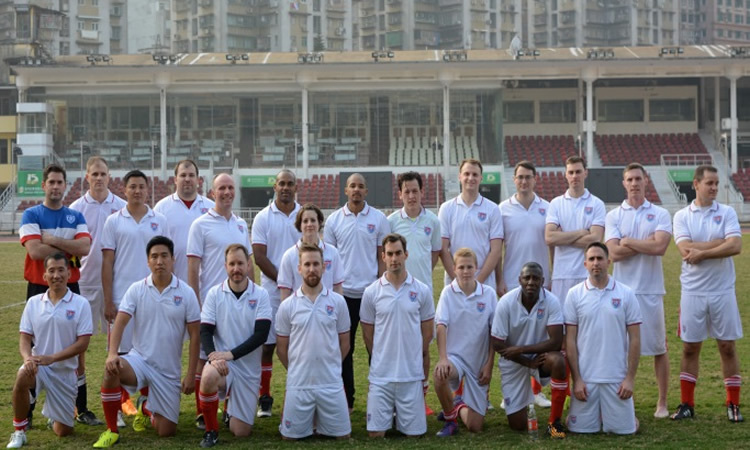 The Consulate's soccer team played the Macau Department of Public Safety team in Macau on January 30th, 2015. 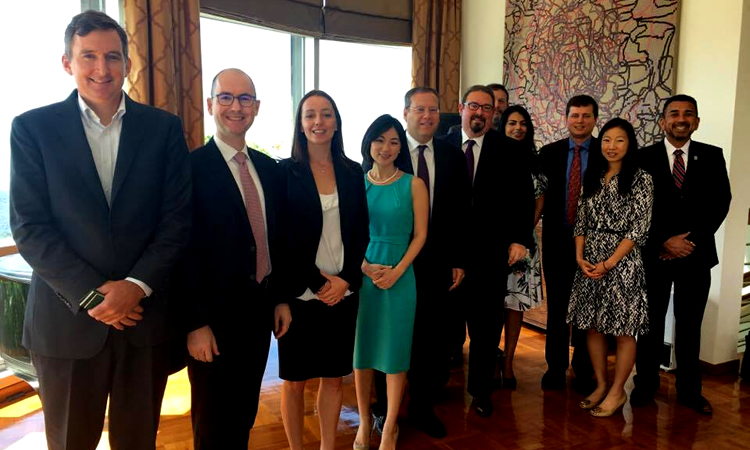 Jan 27, 2015 - The Consulate hosted Robert Wang, the U.S. Senior Official for APEC, as a participant in meetings for the APEC Business Advisory Council. 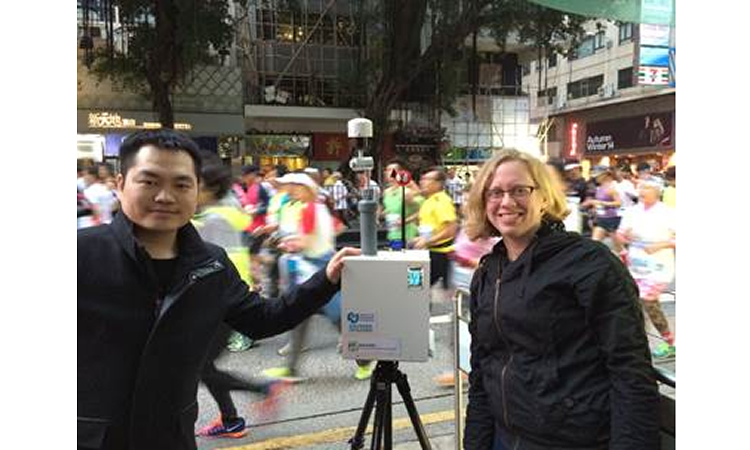 Jan 25, 2015 - EPA Environmental Engineer Dr. Hagler collaborated with air scientists at City University and the Hong Kong Environmental Protection Department to monitor air quality along the Standard Chartered Hong Kong Marathon. 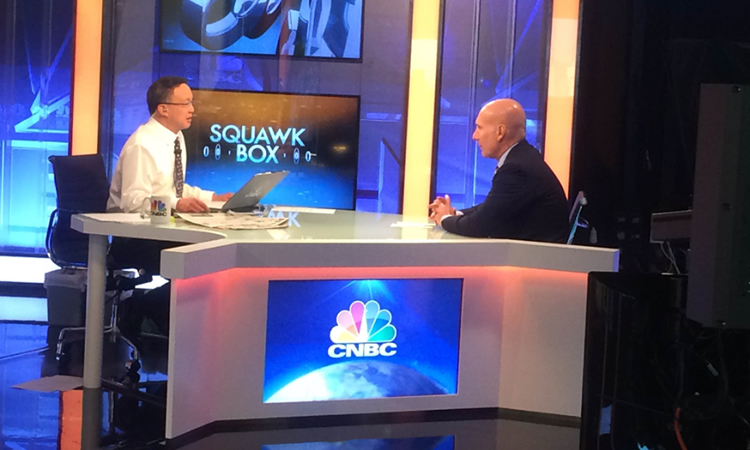 Jan 20, 2015 - Under Secretary of Commerce for International Trade Stefan Selig sat for a live interview with CNBC's morning program. 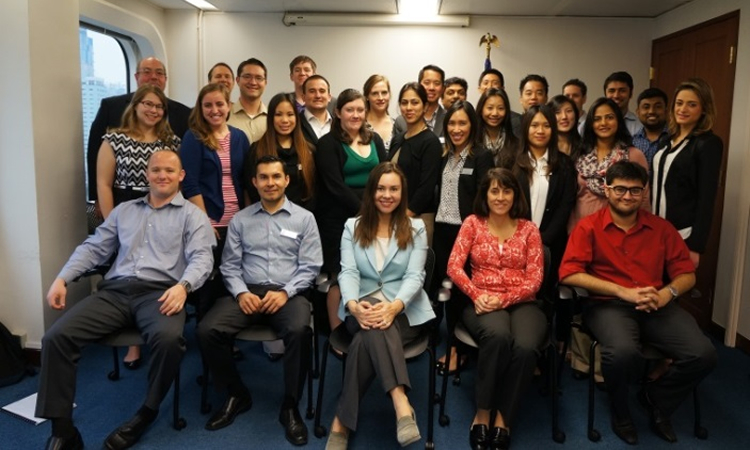 Commercial Officer Marsha McDaniel and Economic Unit Chief Marc Forino briefed twenty-four MBA students from California State University Fullerton on January 12th, 2015. 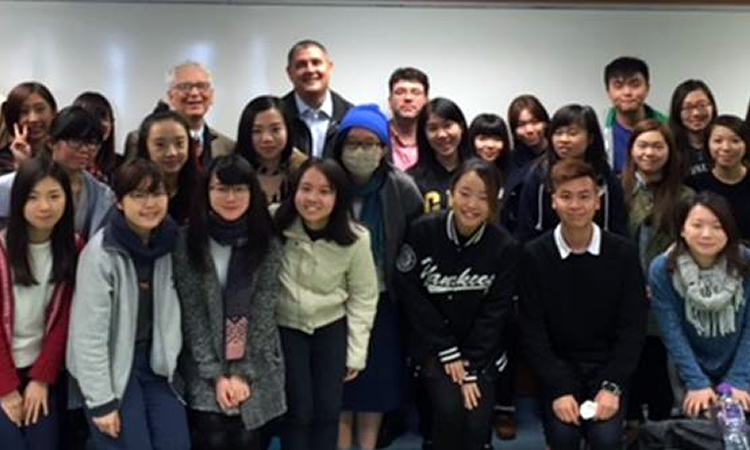 Assistant Information Officer Tau Shanklin Roberts and Consular Officer Paul Colombini spoke to students and parents at the Macau Education Department's student center on January 9th, 2015. 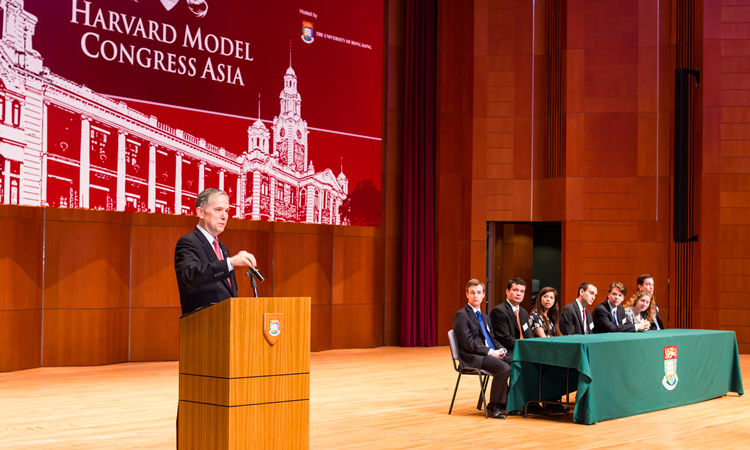 CG Hart addressed high school students representing countries in Asia, North America and Europe at the 2015 Harvard Model Congress Asia (HMCA) conference on January 9th.